In historical order: blue numerical dots are the current locations of refugees collective WE ARE HERE. Past locations are in green numerical dots. Plus a list of temporary accommodations marked in brown dots. We Are Here started on September 4, 2012 with some tents in the garden of the Diakonie in Amsterdam. A handful of people came together to seek for shelter. There the idea started to make themselves visible and to start a demonstration. 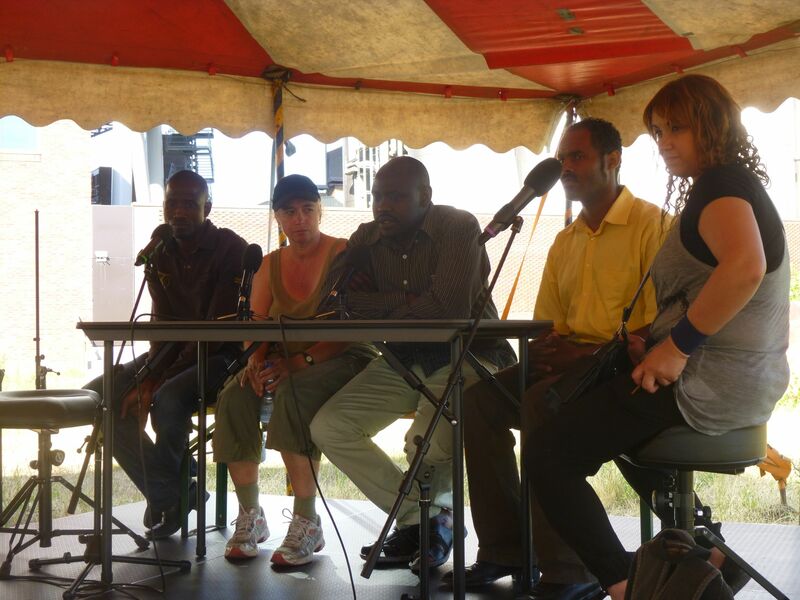 They got their inspiration from the demonstrations and Tentcamp in Ter Apel and also by the Arab Spring. Exactly a year later they were back in this garden. To commemorate the start of We Are Here. And to plant a tree. 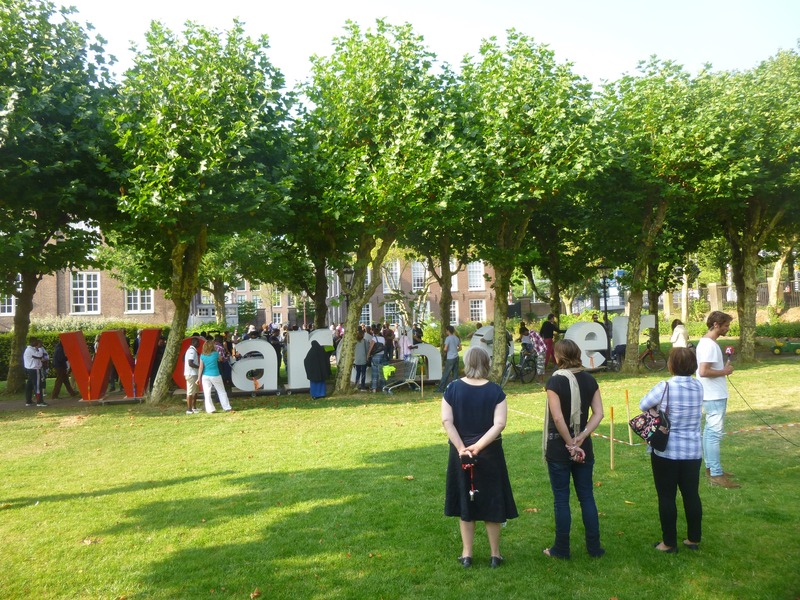 Big wooden letters were pushed through the City from Amsterdam West. 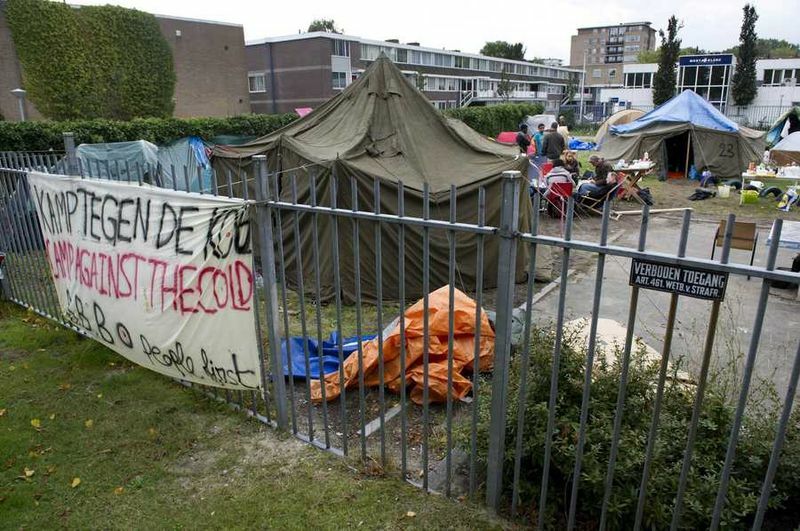 The group got national attention by starting a tentcamp in Osdorp, where it grew to around 90 people and attracted a lot of media and supporters. It was a very cold winter and the people lived in leaking tents only warmed up by the hot cofee and tea that was brought by some neighbours constantly. 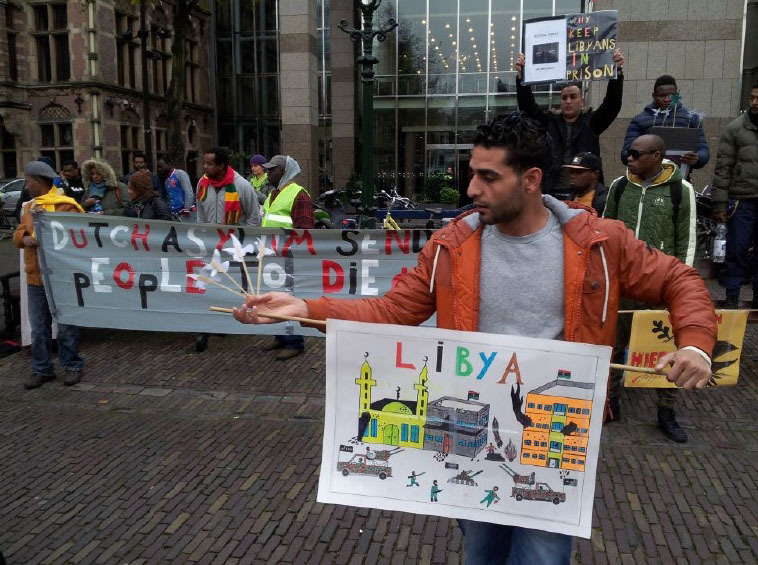 We saw a new phenomena: demonstrations organised by refugees. 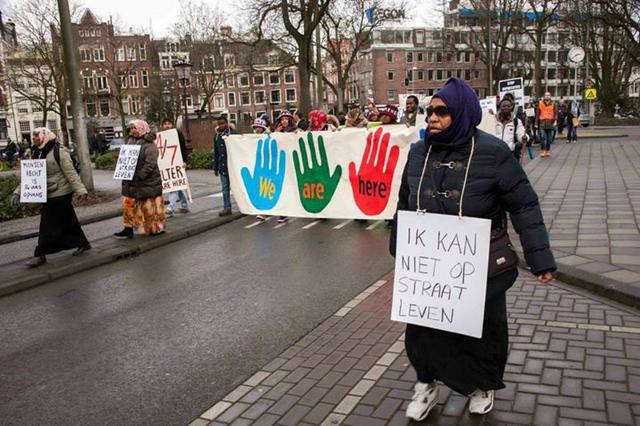 On November 10 a big demonstration walked through the city of Amsterdam from Dam to Stopera. It inspired many. 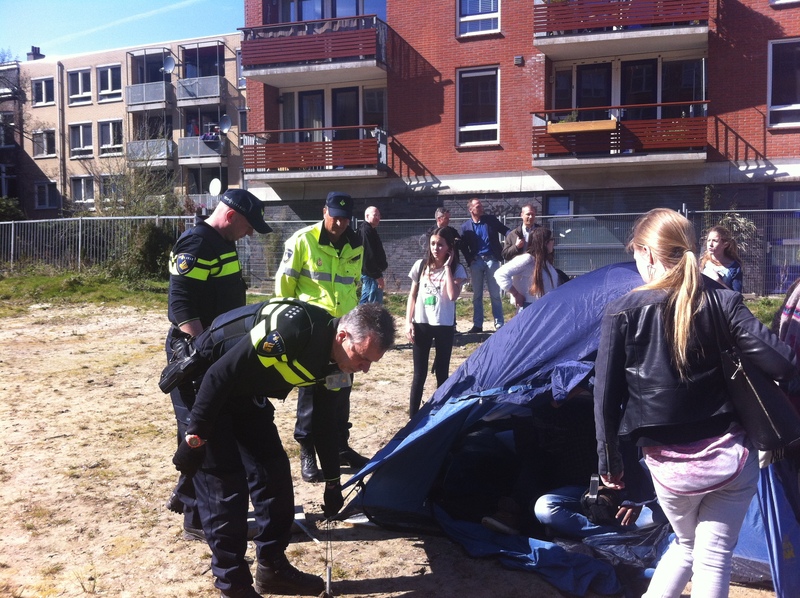 The eviction of camp Osdorp at November 30 resulted in the arrest of all refugees. Most of them were ‘released’ or actually put back on the very cold street again on the same evening. Some of them were put in prison. 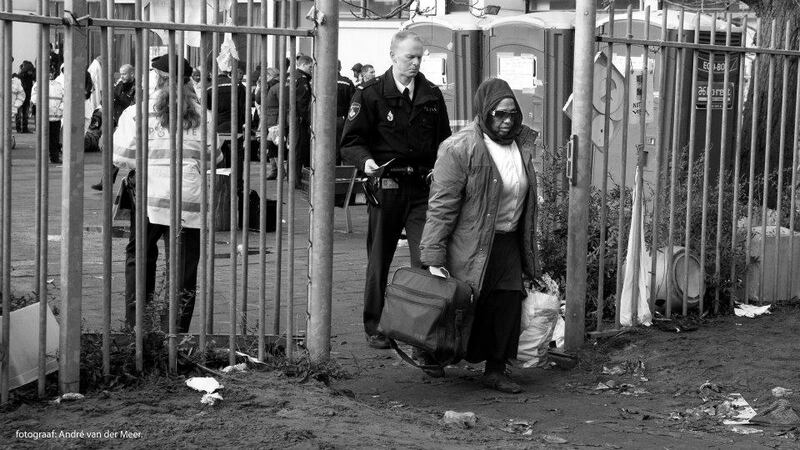 The refugees were picked up from a busstop close to the police station and after a couple of nights, where the Bunker in the Vondelpark and OT301 offered emergency shelter, the next ‘home’ of we Are Here was the Vluchtkerk (refugee church) a squatted empty church that was turned into a cold but at least dry shelter with approval of the owner. This location attracted new media and new supporters. Churches, mosks, organisations and volunteers came to offer support and also supportive lawyers became involved. 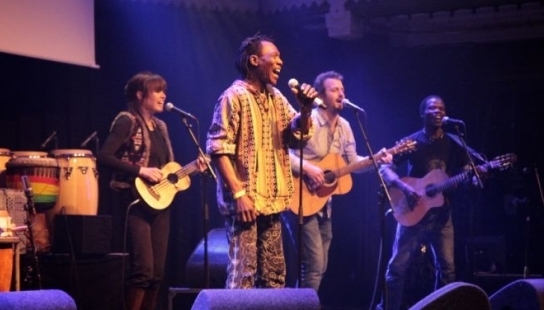 There were performances by well known Dutch artists like Anouk and Ty Phoon and the We Are Here band performed in the church and also in other venues like Paradiso. Letters were written to the group members in prison. The biggest demonstration took place in this period. 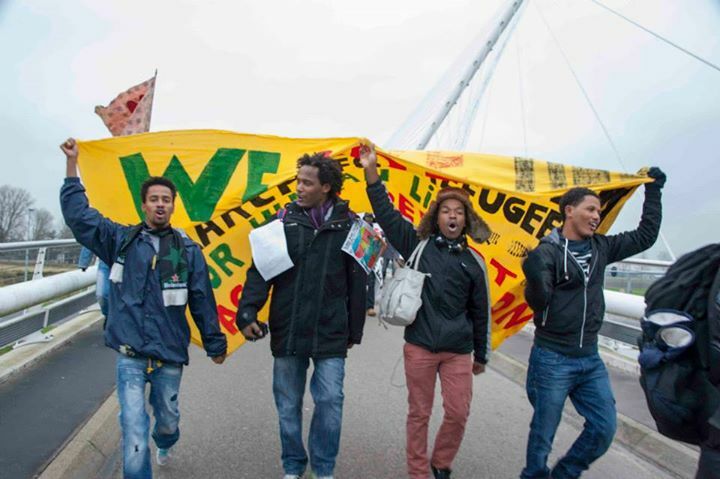 Under the name of Refugee Action 2013 and with the slogan No refugee on the street or in the cell, 2500 people from the whole country, including refugees from AZC’s and supporters, gathered at the Vluchtkerk and marched to Museumplein. When the group had to leave the church, to everyone’s big surprise the buses from Theaterstraat showed up and took the people to a newly squatted place. 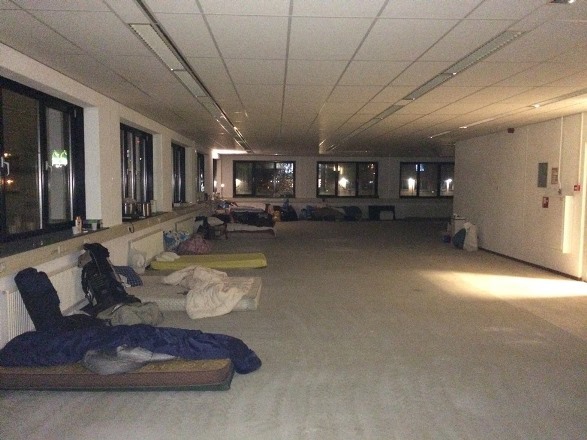 This was the Vluchtflat (Refugee Flat) where people finally got their own private or shared rooms. This period included summer and Ramadan and also a well deserved break from continuous actions. 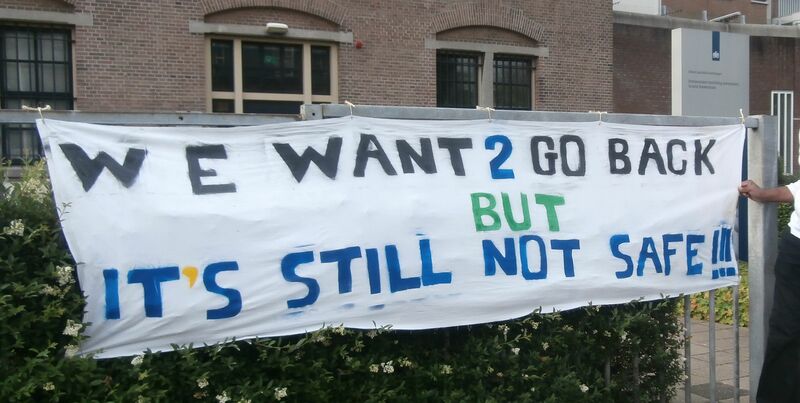 Still some people realized that action should continue, because life in the Vluchtflat was still far from normal life. 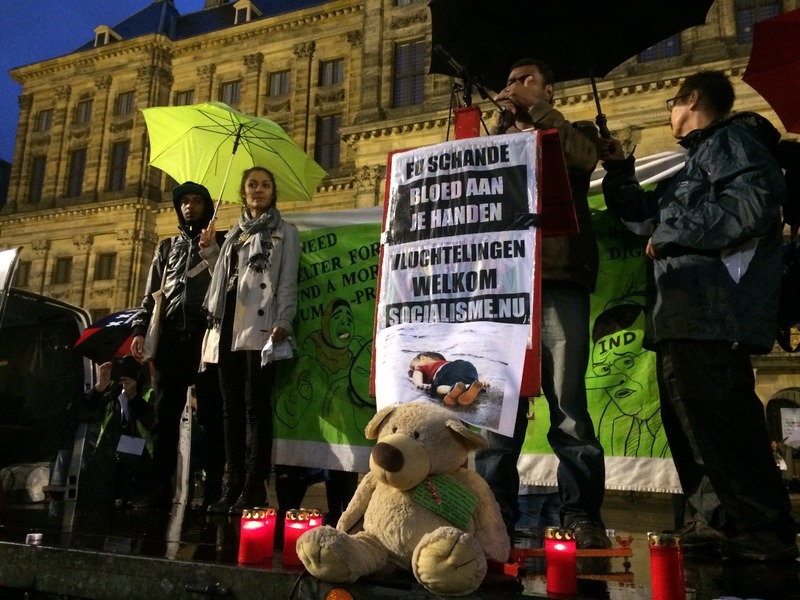 A group of people initiated an action at Dam square and Stopera (City Hall) where they slept outside in the rain. 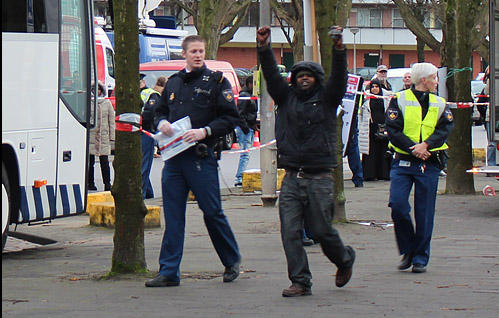 Several were arrested but others went to another squat, the Vluchtpark (Refugee Park). 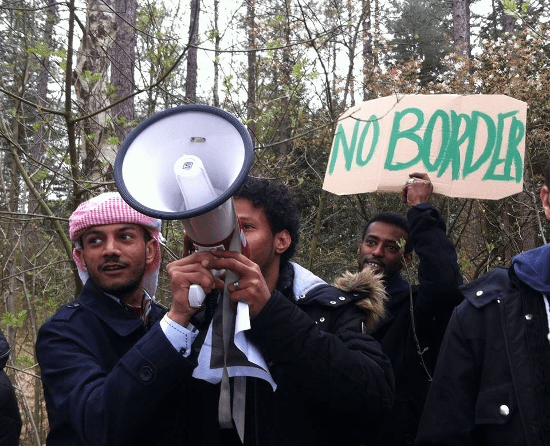 Also in this period the No Border Camp in Rotterdam took place, where people of We Are Here told their stories, created networks with people from other countries and showed solidarity with the refugees in prison at detention center Rotterdam. 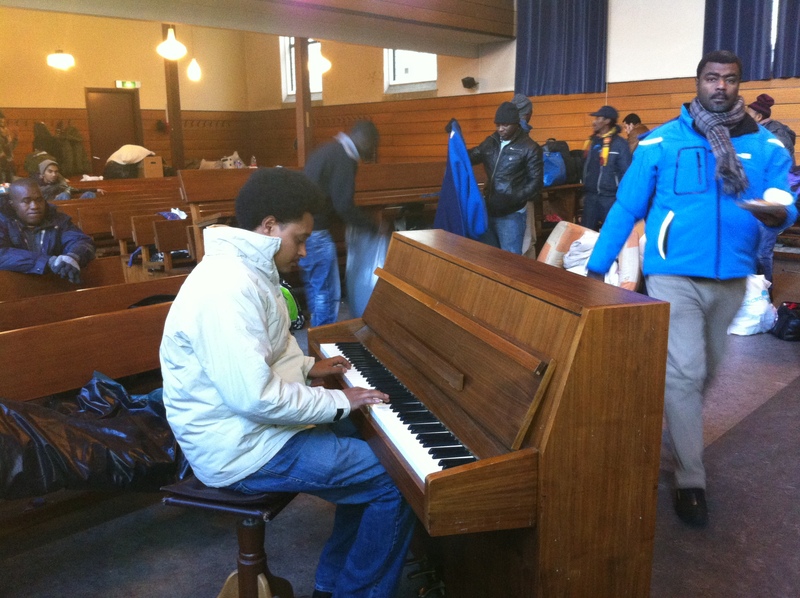 When the group had to leave the Vluchtflat, they received night-by-night shelter from churches and the squat movement. 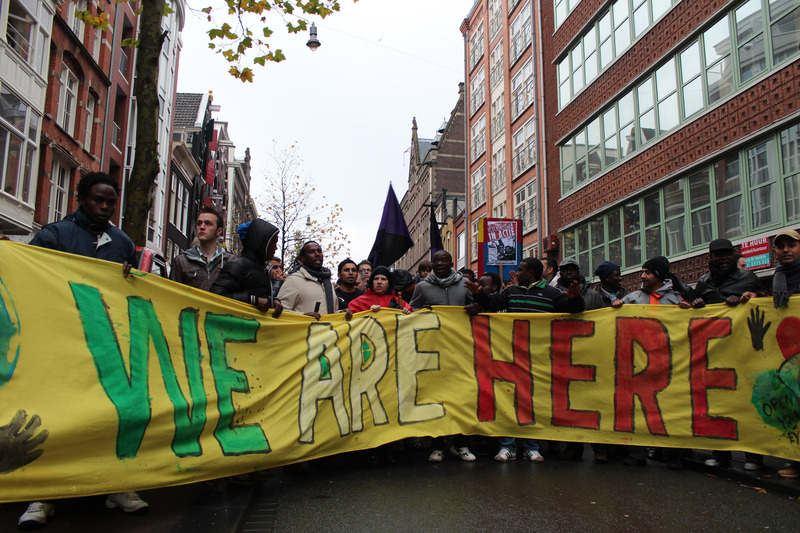 After a few days a new home was squatted for them – this time in the middle of the center of Amsterdam, opposite of the Rijksmuseum. 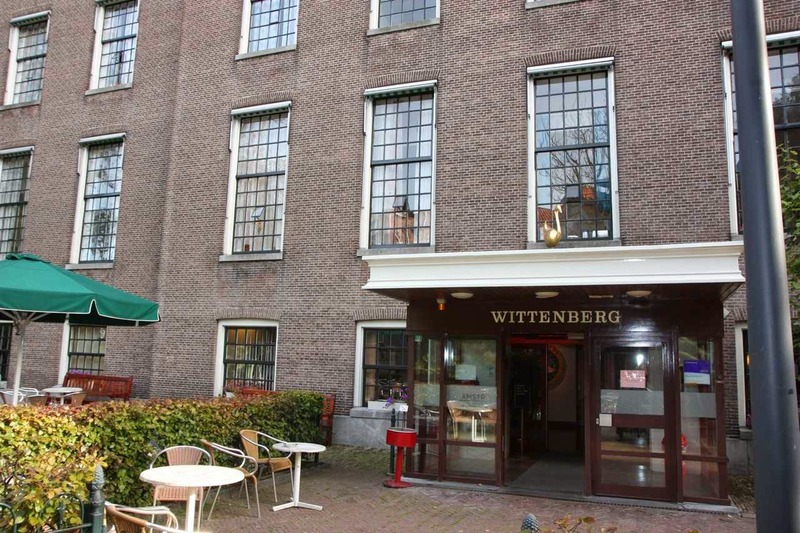 This became the Vluchtkantoor (Refugee-office) or Vluchtschans at the Weteringschans. It was nice to be so close to the center, so that related activities in the Balie and Paradiso could easily be attended. The owner, however, immediately started a court case and the refugees decided not to go to court and to leave the building. At the end of October a ruling from European Commission ECSR stated that authorities should give shelter and food to refugees. It was still unclear how the Dutch government would put this advice into practice. Lawyers and human rights organisations started working on this issue. 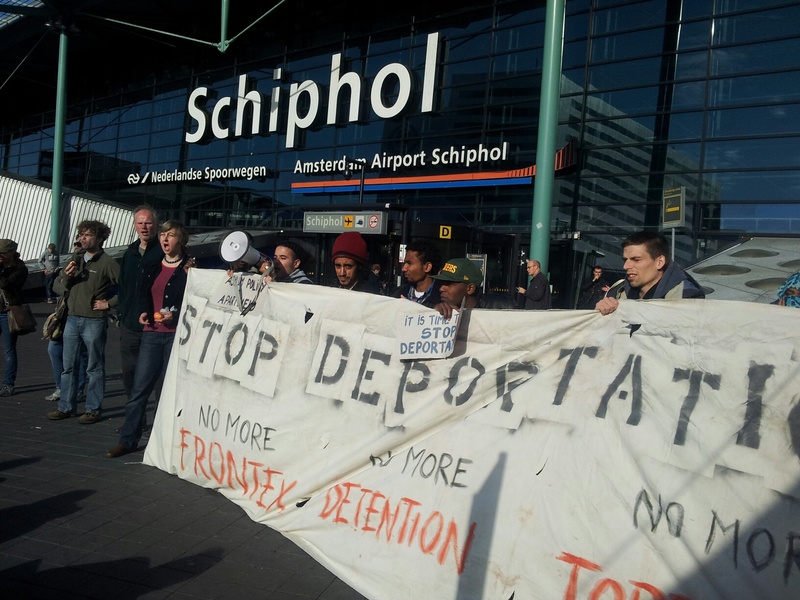 Action took place in front of IND office and at Schiphol to protest deportations and We Are Here spoke in parliament. 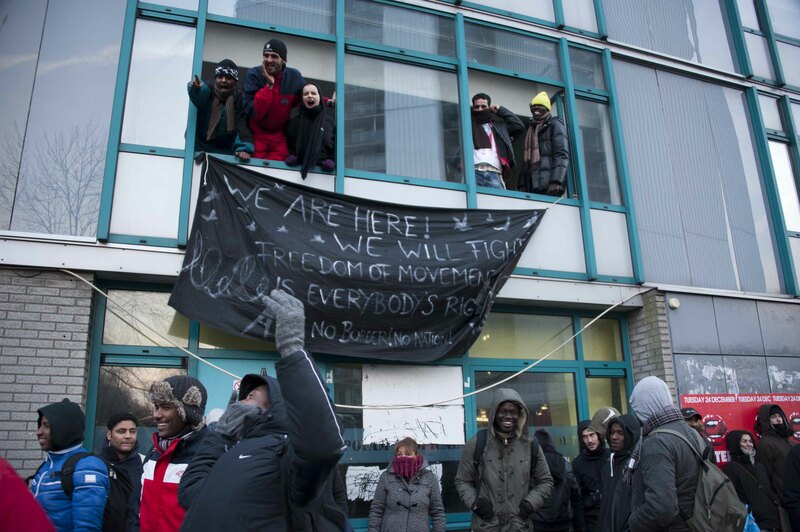 After the eviction of the Vluchtkantoor, the group got dived. 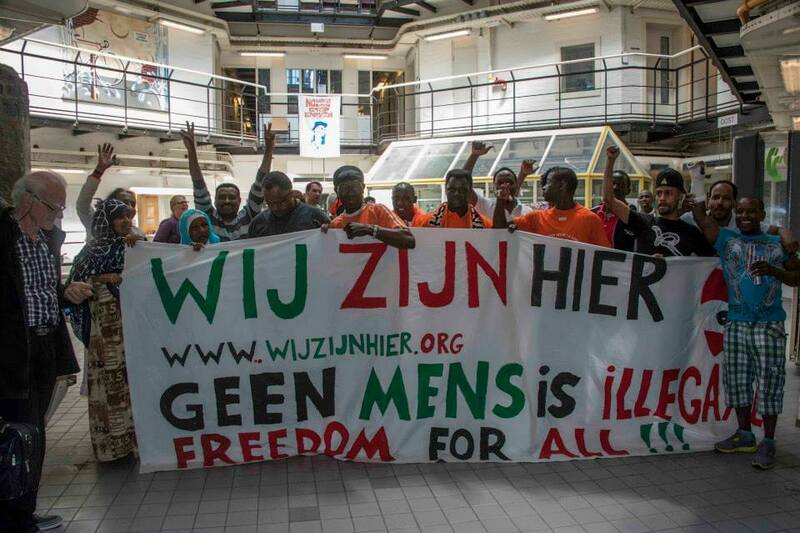 Part of the group was allowed to take shelter in a former prison for six months (Vluchthaven at the Havenstraat), paid by the gemeente. After a lot of discussion in the group (mainly because of the trauma’s many refugees have with prisons) people decided to sign; out of fear for being put in real prison. Most people that signed, were however not allowed to go in, because they were not in a certain list. For some people (women and sick people) temporary shelter was found. The others were literally back on the street again. Women and sick people got shelter at the Surinameplein and in the Hebron church. 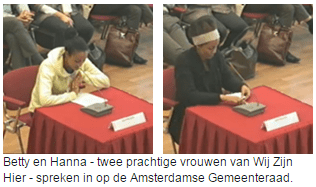 On February 11, the last person of the Surinameplein got the news that she could move to the Vluchthaven. 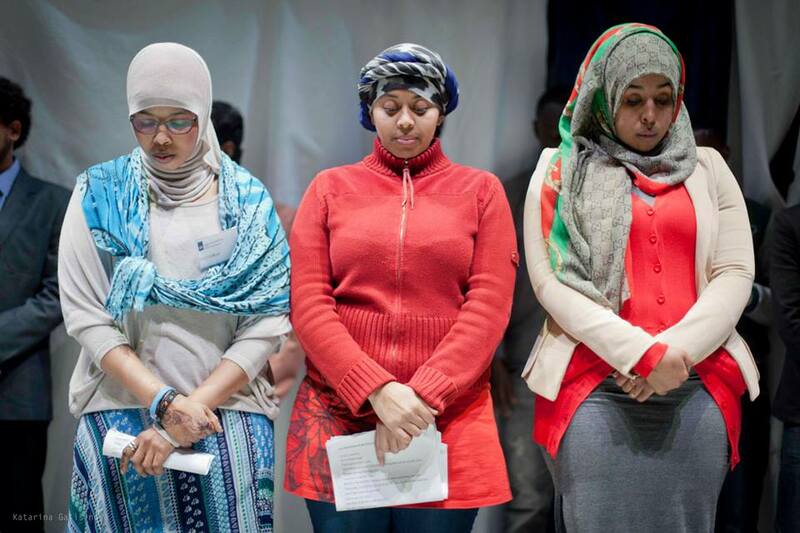 In April the small Hebron church announced the refugees that it took care of had to leave. Lawyer Pim Fisher started a case to ask for shelter for the sick people. 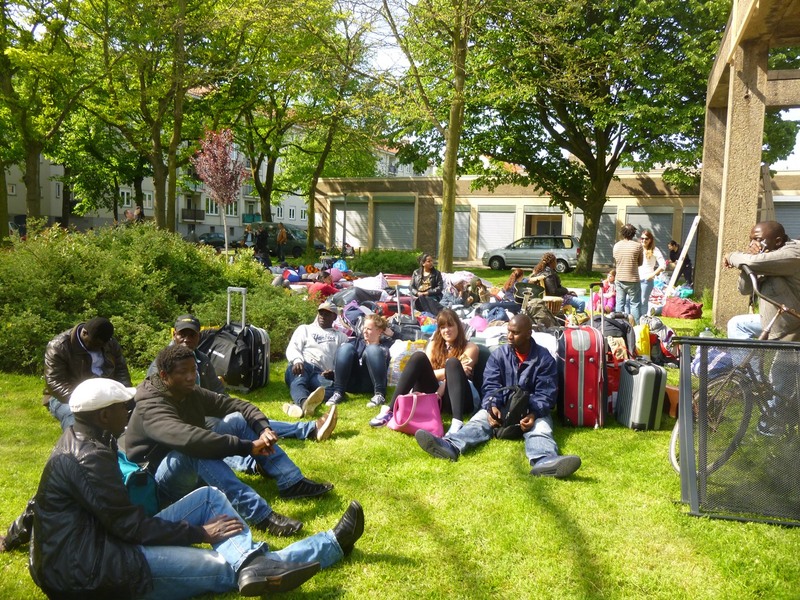 The people that were not allowed in the Vluchthaven were homeless again. 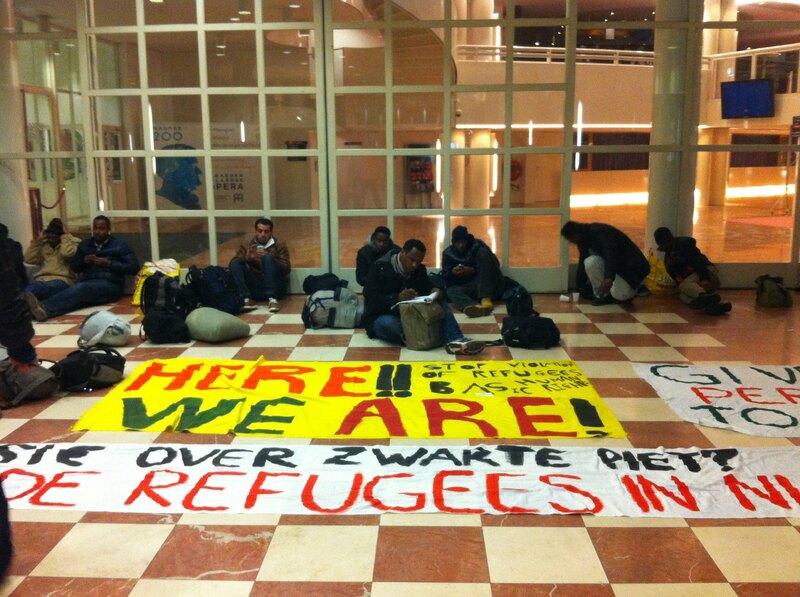 Day by day volunteers tried to find shelter for the group for one or two nights, moving from squats, to churches, from Amstelveen to Amsterdam, in the meanwhile protesting at the cityhall and in the center of Amsterdam. 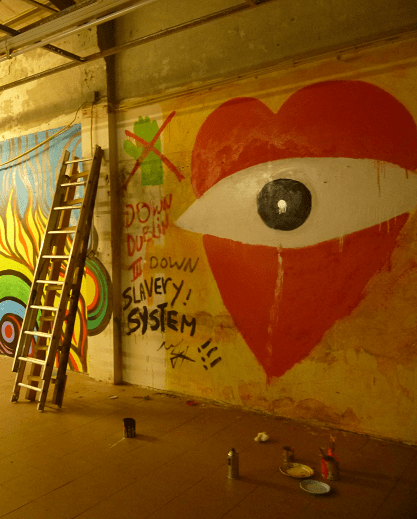 Finally a new place was squatted: the Vluchtgarage in Amsterdam Zuidoost. 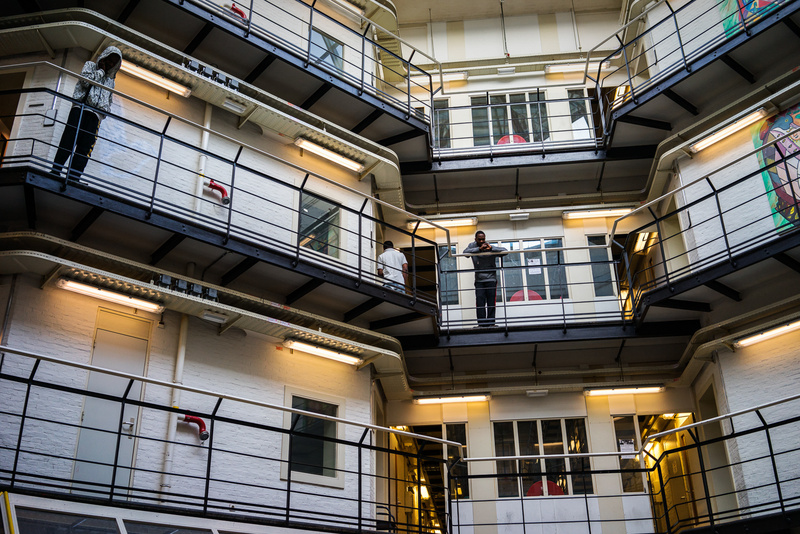 The refugees were sceptic about the offer of the prison at the Havenstraat, but the Major of Amsterdam assured them they would be supported to work on their future, wherever that future would be. At the end of the ‘project Havenstraat’ however, the Major stated the pilot was unsuccesful because only few people returned to their country of origin. It was clear there was an hidden agenda. 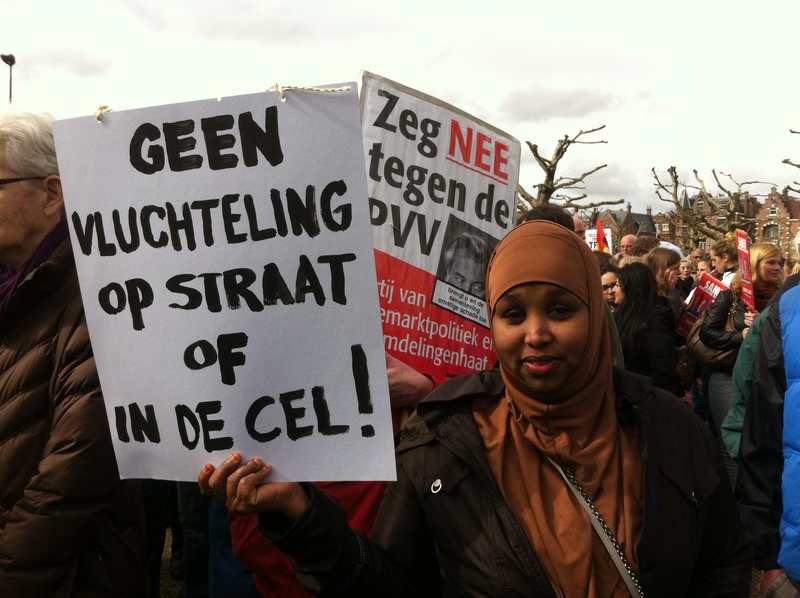 It also became clear that the real issue is the gap in the Dutch asylum policy. Refugees cannot go back, yet do not get a status, and can also not go anywhere else. 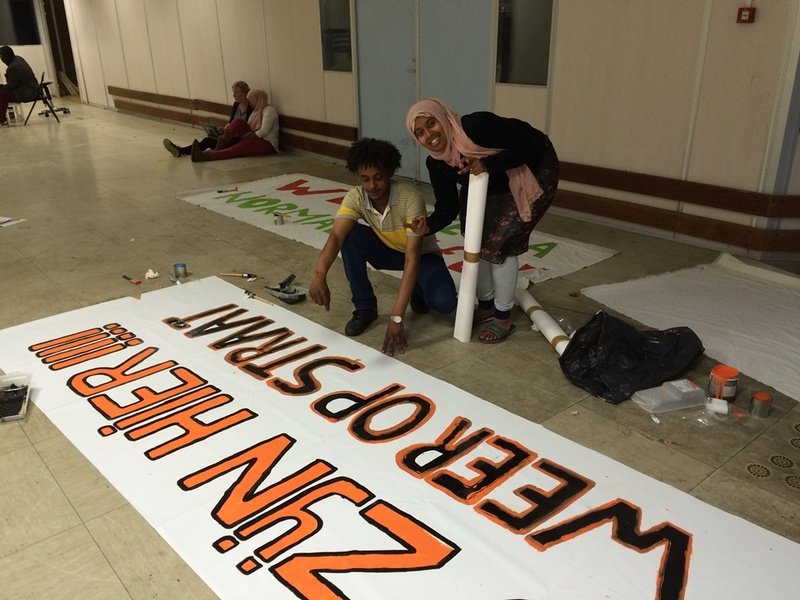 Volunteers made a plan for the refugees to work on their future. 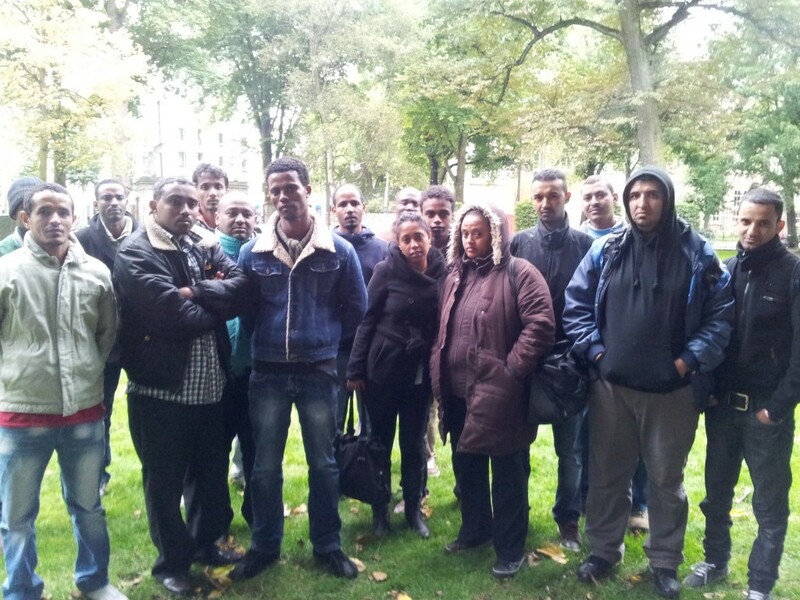 This included trauma-care, courses and workshops and assistance with their asylum procedure. It took the gemeente several months to take over this plan and start executing it. In the mean time refugees were faced with guards from the justice department that made it often difficult to feel at home and volunteers who wanted to assist had strict visit times and were obliged to show their ID. 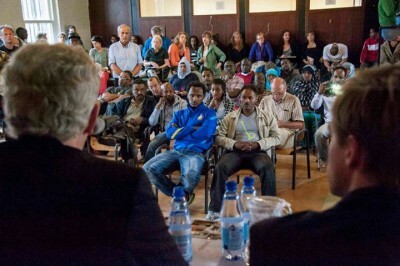 After 6 months the city council told the refugees to leave. They refused. In an amazing evaluation it is describes once again why the people cannot go back to their countries and also cannot live on the street from nothing. Also why the 6 months ‘pilot’ actually became a ‘2 months pilot’ because the city council started so late with the promised screenings, assistance and programs. 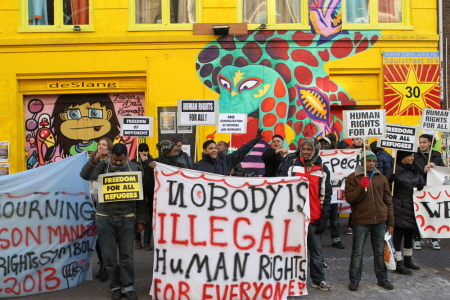 After a court case, twice postponed verdict and appeal, the group left the building voluntarily to prevent eviction and arrest by the police. The Vluchtgarage in Amsterdam Zuid-Oost became a very known term in The Netherlands. This place was a garage with offices attached to it. It was turned into a place to live, however, basic human conditions were never met. The winters were cold. There was no proper heating and not enough electricity. The place has no showers. Neighbours offered for months places to wash and shower. Luckily the inhabitants managed to find their way in the area and found organisations that could assist. Stap Verder was a great help to them. The group tried to stay visible by attending council meetings and demonstrations. 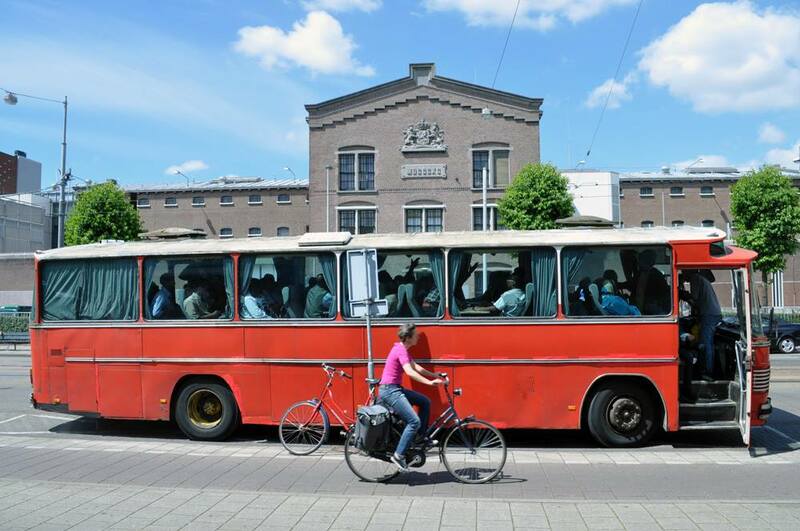 In June a bus left from Vluchtgarage to Brussels, to attend a demonstration in the international action week. 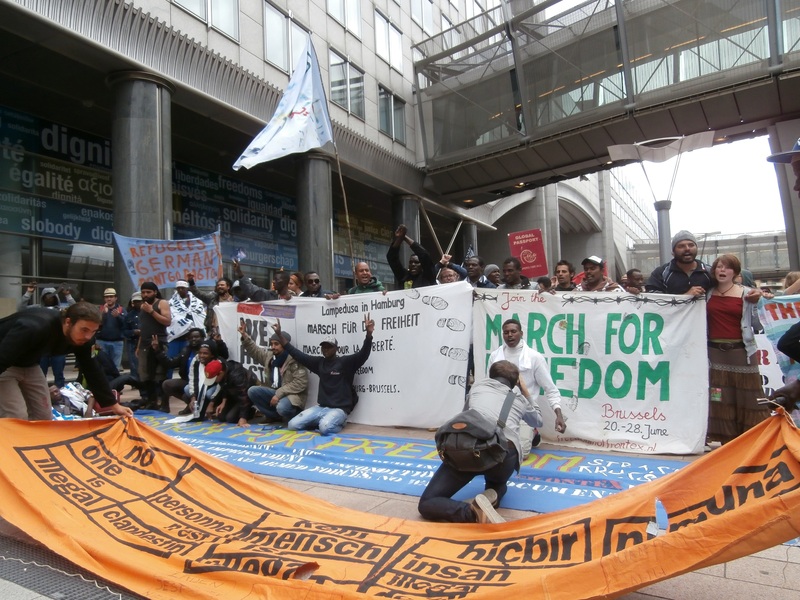 Some people attended the refugee march from Strasbourg to Brussels (1 month) before that. 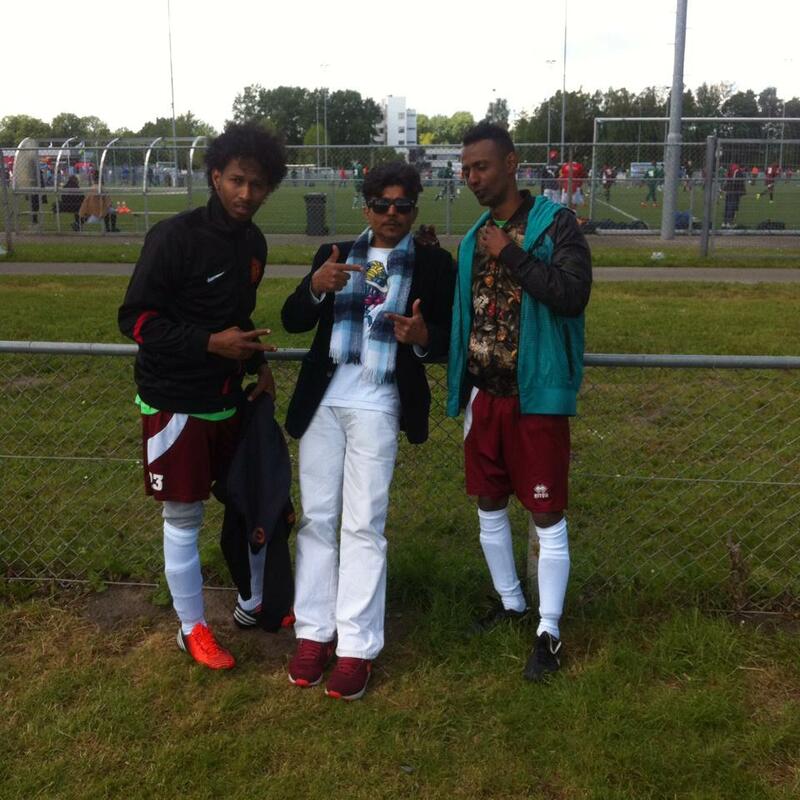 They also started a football team and played several teams in Amsterdam, quite succesfully. There were nice moments (like an amazing benefit party at the Vluchtgarage) and dramas (like the funeral of Hamza). They joined an amazing theater project ‘Labyrinth’, and made a dance performance, they helped Theaterstraat after their place was destoyed by fire, in December a march from Amsterdam to The Hague was organised, Alexandra Jansse’s documentary “We Are Here’ was launched and Rogier Pelgrim recorded just before the eviction a song and clip in the Vluchtgarage: ‘Won’t go back’. 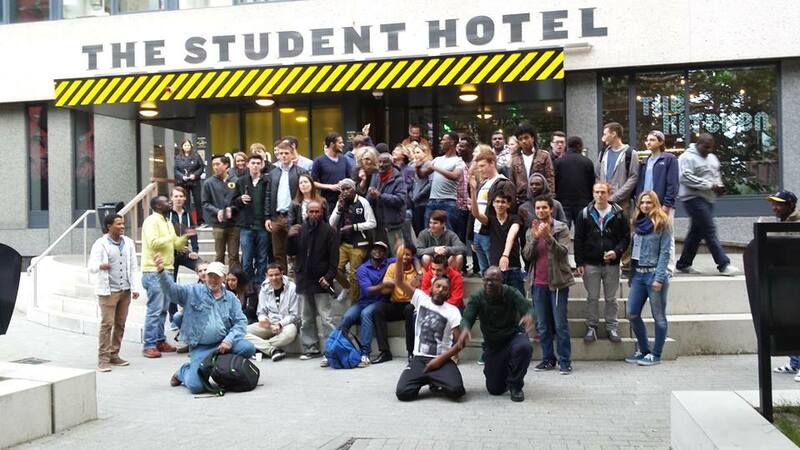 On 13th of April a new place was squatted. The Vluchtgarage is full, new people are arriving and also women appear at the doorsteps and all locations to provide shelter to women are full. A new chapter of We Are Here started! And ended…. with a courtcase. People left, very sad, their nice new home, that they turned from a ruin into a beautiful place, where they felt happy and safe and had open house every Wednesday evening, with food, falaffel and pingpong. The refugees thank the neighbourhood and the people from the market in front of their house for the wonderful time. 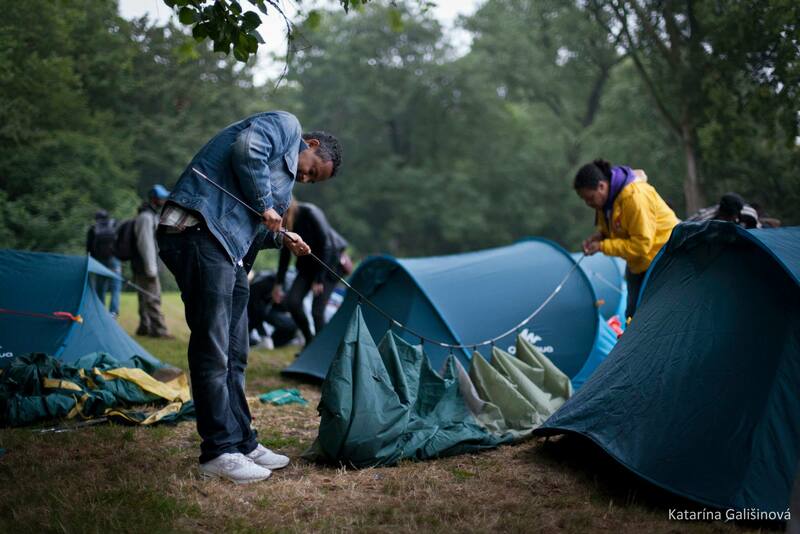 After the eviction of the Vluchthaven, the group walked from Amsterdam South to East and started a tent camp in the Oosterpark. When the police threathened to evict them, they packed their tents again, not knowing where to go. 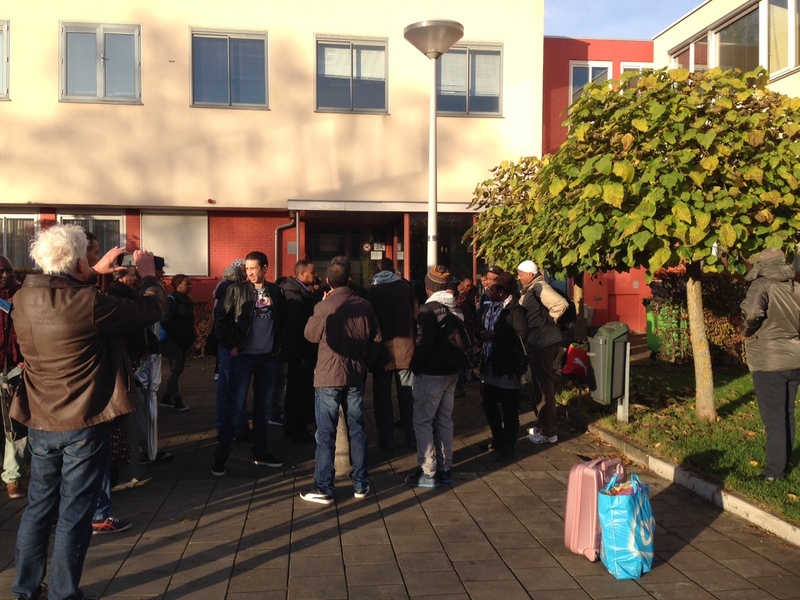 In the mean time some refugees of the action group We Are Here, opened Vluchtopvang at Linnaeushof 4. Unfortunately the group lost the court case and had to move out quickly. 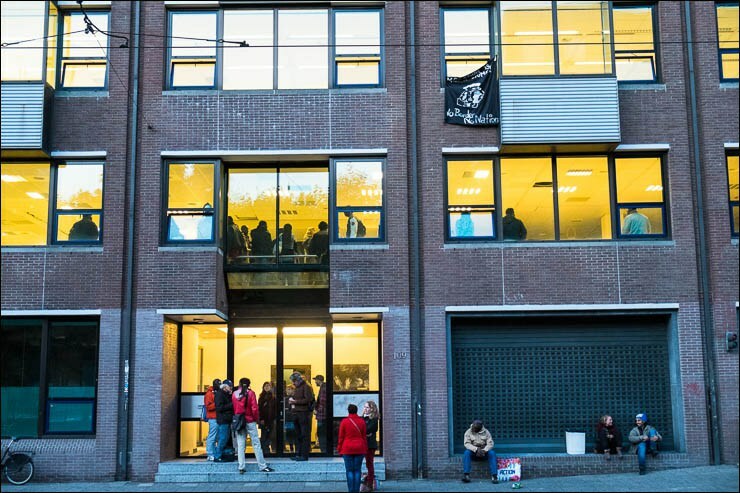 After a very quick and intensive move, people moved into a newly squatted building at the Zuidelijke Wandelweg 30 in Rivierenbuurt – close to RAI / Mirandabad. It was an old school and not in use but the judge decided on an emergency eviction. 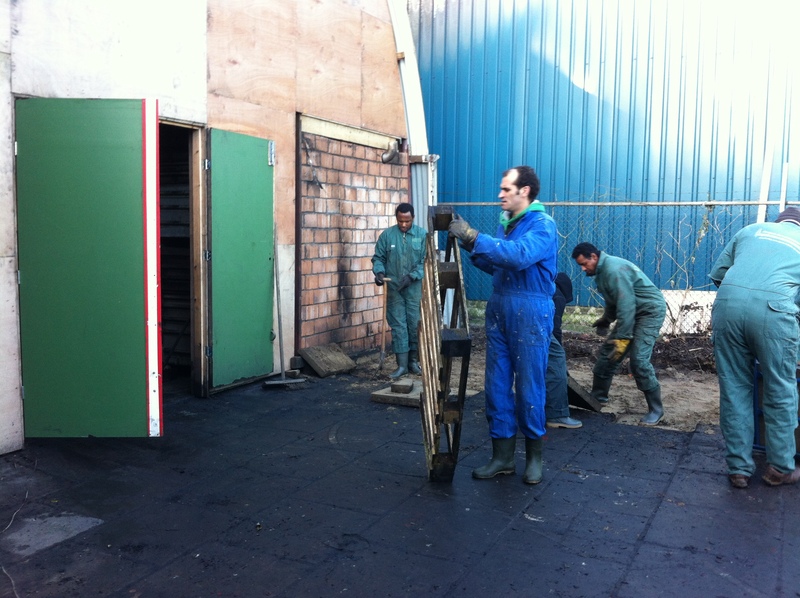 After eviction from the Vluchtschool a third building was squatted. This became the Vluchtgebouw (Refugee building) at the Jan Tooropstraat. After meeting with the owner, he agreed with the group staying in his building and he offered water and electricity. Lawyer Pim Fischer continued his legal fight for human rights for this group, mainly focussed on shelter. During several weekends the Winter-Day-Camping decorated the building nicely. The legal struggle continues and We Are Here speaks repeatedly in the city council meetings. Some wonderfull, strong, amazing woman spoke out – on actions, on stage, in the media. They received prices and became icons for the struggle. They also performed in the theaterplay Labyrinth. 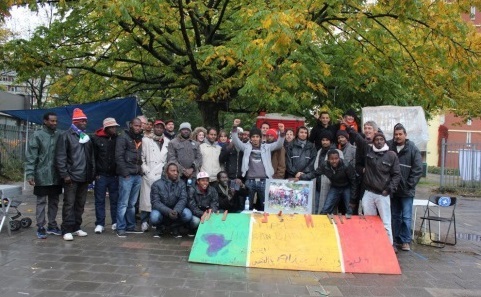 – August 23: at the day of the eviction of the Vluchtschool, the group went to Plan C.
– September 24: the group went to Amsterdam Noord, De Ark. At the Wittenberg location the big banner with hands was made, meant for the big demonstration for 24/7 shelter. 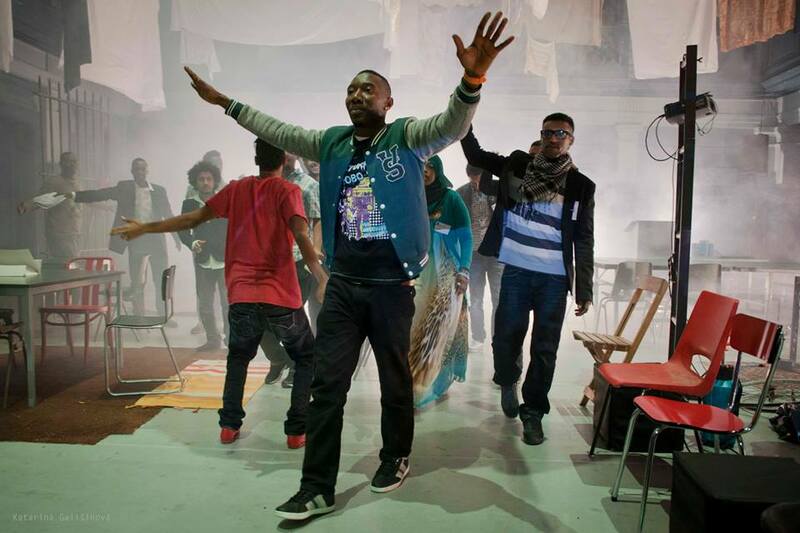 For this action the idea of the hands with ‘I AM HERE written on them came up and was used in several flashmobs. The demonstration started from the Wittenberg where everybody gathered for tea and coffee. Also the (com)memoration of three years We Are Here was held here. People attended the We Are Here Acadamy and dance and theater performances. 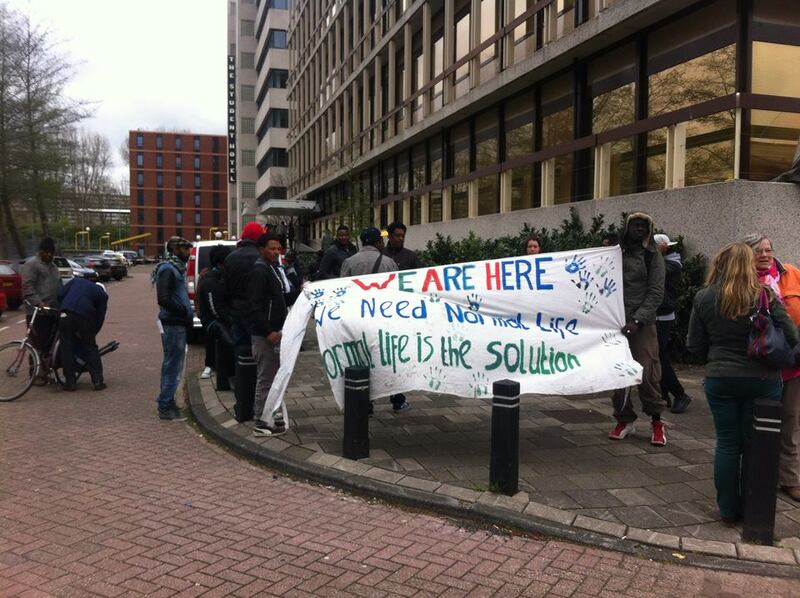 April 13th the group refugees was evicted from the Vluchtgarage. A large group of police and riot police entered the building, where everybody had already left. 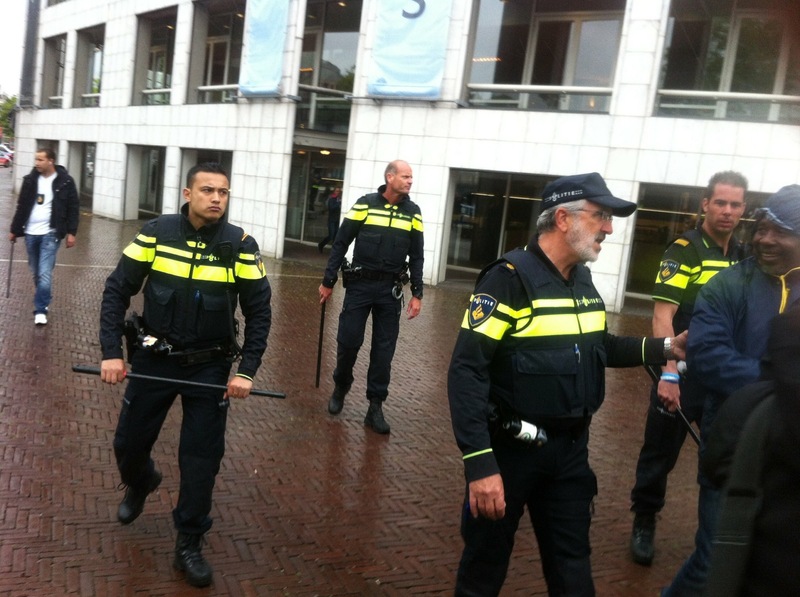 In a demonstrative walk from Zuid-Oost to the center of Amsterdam several refugees were arrested. After demonstrations at the city council, a joint demonstration with students, a dinner in a park, and a lot of walking on the streets, the group set up a tent camp. The next day eviction was announced. Students from the adjacent IVKO school came to show solidarity with the refugees. 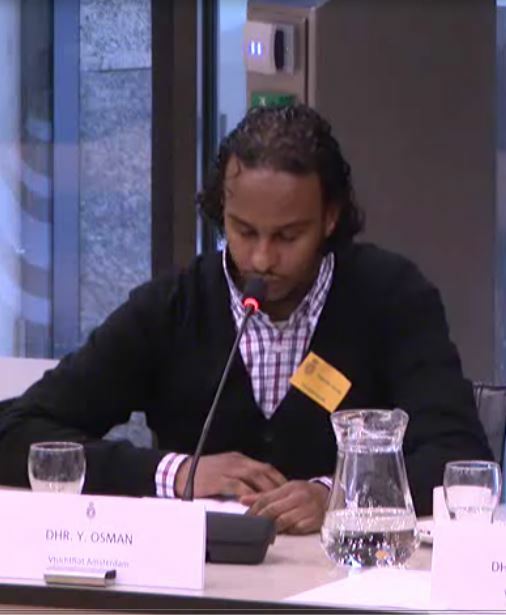 In the mean time the group became national news, because their case at the European Comittee of Social Rights that was started by the Diakonie at the Vluchtkerk time, was discussed by the European Ministers and by Dutch government. A governmental crises arose from it. The images of this tentcamp were shown several days at the national media. After the eviction the group could once again sleep in the Vrankrijk. 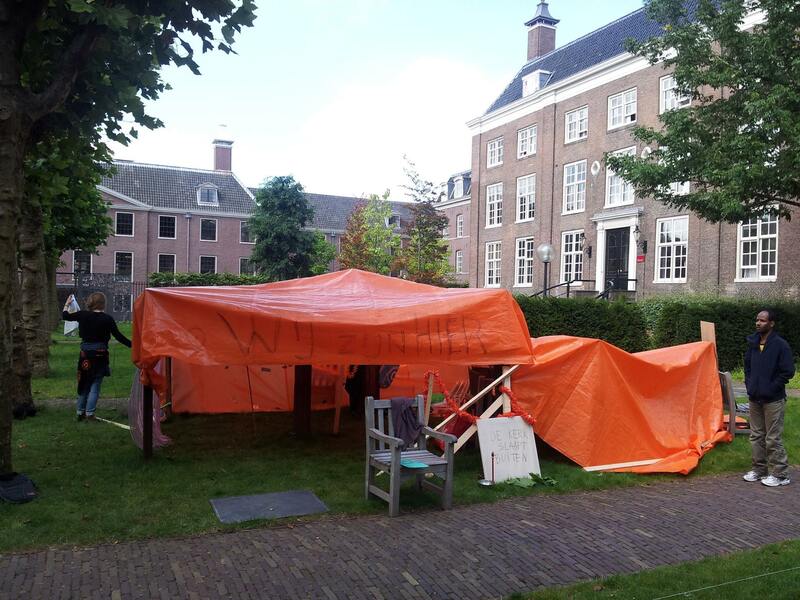 After another day on the street, with protests at IND office and in the Vondelpark, a new place was squatted for them: the Vluchttoren. The squatting of the Vluchttoren was in addition an emotional reuniting with another part of the group, as it was the building next to the Vluchtgebouw. The first days a lot of demonstrations took place with the two combined groups – in Amsterdam and Den Haag, to show that the talks of the government that took days and nights are actually about people. People who need human rights. The Vluchttoren is a big building, but for fire-safety reasons only the lower floors can be used. Facilities needed to be improvised because of lack of electricity and hot water. 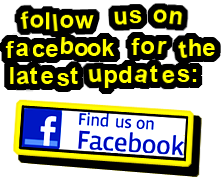 Initially the owner agreed with a short stay, but because of his change of plans he offered the place until August 28. That means some improvements could be made: a kitchen and an improvised ‘bucket-shower’ were created. Fitness-classes, a BBQ with the neighbours of the Student Hotel, birthday parties of volunteers and a big benefit party with bands, music and a lot of dancing took place in and around the tower. 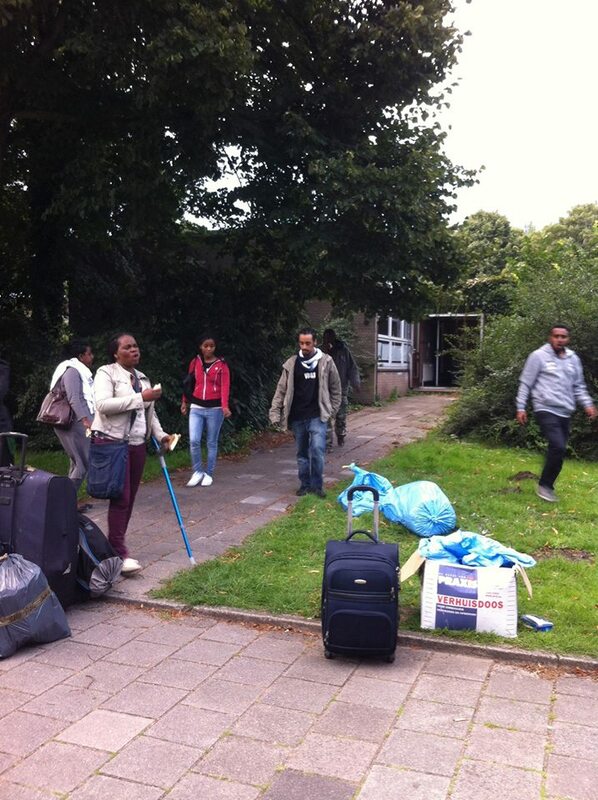 After the eviction from the Vluchtgebouw Schram Studio’s at Vlierweg in Amsterdam Noord offered the group temporary accommodation. The group walked to the city center for a protest at the city hall, where several refugees were arrested and many refugees and supporters hit hard by the police. After this tough day of rain and being beaten up, the group was very grateful to find a roof for the night and food brought by their brothers from the Smaragdgroup and supporters. The Vluchtloods was not big enough to house the large group of the Vluchtgebouw and also temporary. 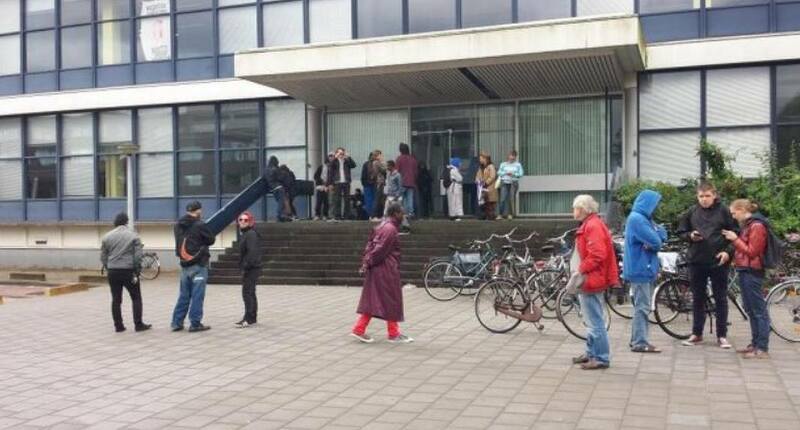 Therefore they squatted the building of the former district office of Nieuw-West. This building has been abandoned for a year. At the moment it is uncertain for how long the group can stay in the building. 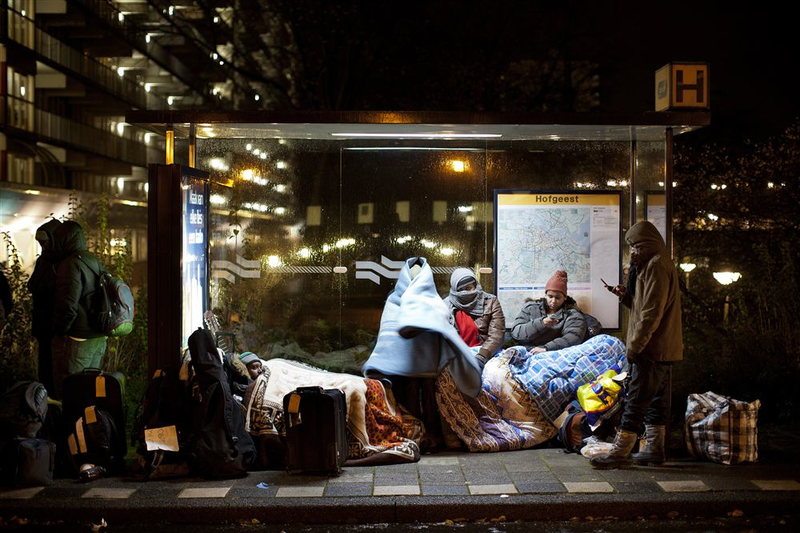 Forced by the official complaint of the Diaconie and by national and European legal, political and humanitarian warnings the city of Amsterdam decided to provide shelter. However, they did not choose the best or the cheapest shelter, they went for the most ridiculous type of shelter called BBB (bed, bath, breakfast). Ridiculous because it means that refugees have to leave the place every day, wander around without work, without money, with all their belongings, in the hope of getting a bed the next day. 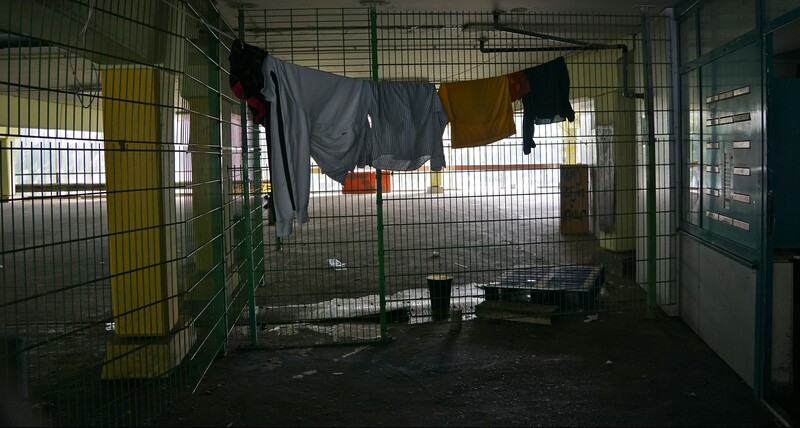 Ridiculous because every day the bedsheets need to be washed, the place is unused during the day, the dinner is prepared by employees, which takes away the last part of independency from the refugees. Ridiculous also because it is an expensive option. 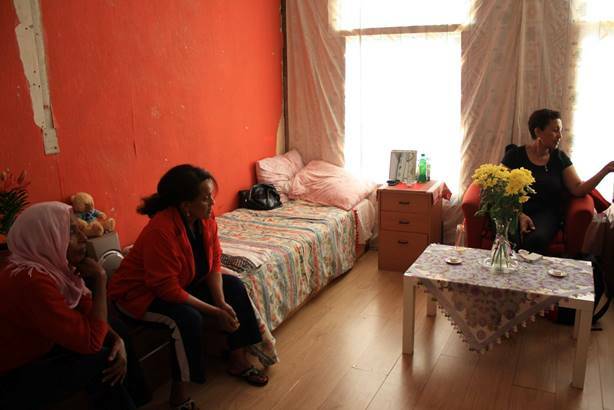 That there is a better and cheaper option was proven by Vluchtoord – a flat in Amsterdam Zuidoost, where ten women and five men lived together in small scale shelter (after a smaller scale trial at the Amstelveenseweg for 6 women, after the eviction of the Vluchtmarkt). They helped eachother, started a bit of study and started to work on their trauma’s. 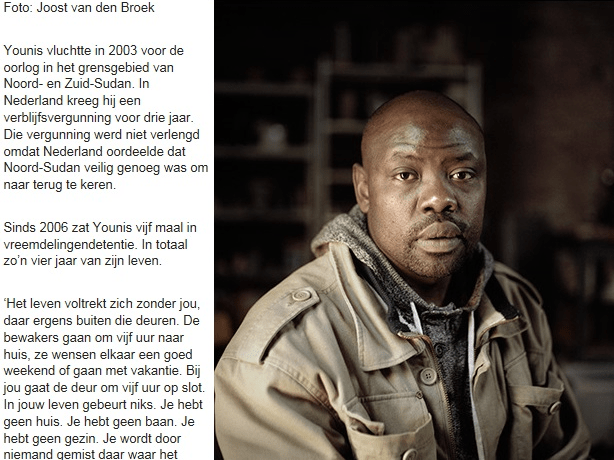 Most important: they finally felt safe in The Netherlands, after terrible histories of wandering on the streets, having lived in scary nightshelters, being raped and abused. The shelter was paid for by the protestant Diaconie of Amsterdam. The shelter was provided from July 9, 2014 till November 4, 2015. At numerous council meetings, protests, interviews, etc people from We Are Here argued that BBB is no solution. It does not change anything abouth the asylum gap that makes live for people impossible and also it is no adequate shelter. 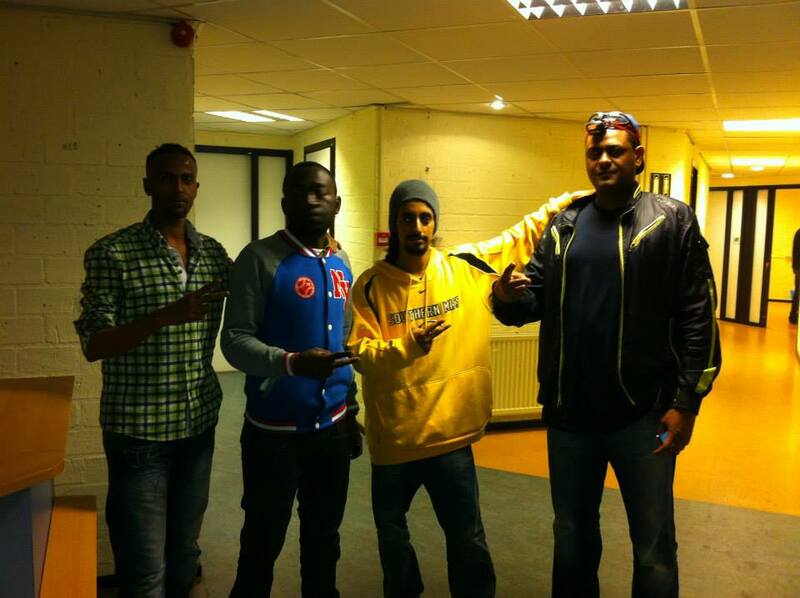 Some of the WAH refugees decided to try the nightshelter. They came back with sad stories of feeling treated like children or criminals, loosing all their independency and dignity. Some others likes the shelter for the night and used it, while they came during the day to the squatted buildings of We Are Here to spend their day. 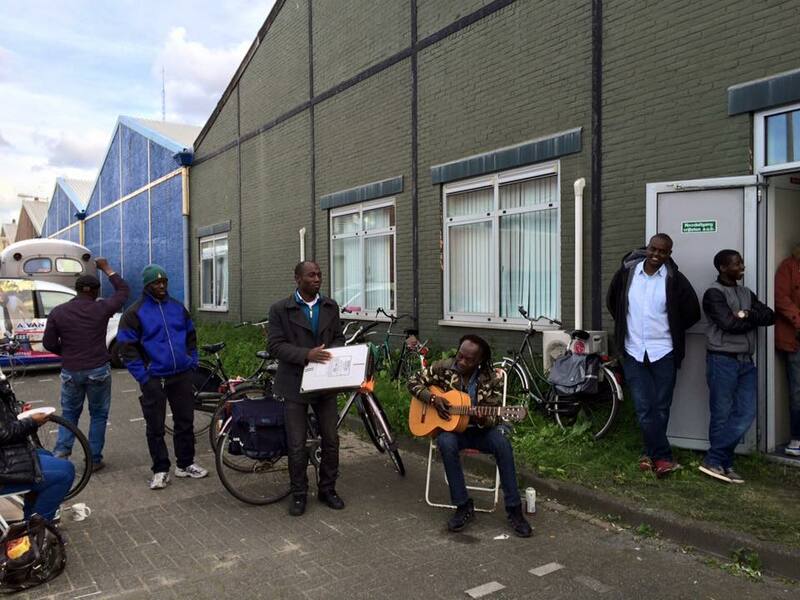 Because the contract with the owner of the Vluchttoren ended, a group of refugees searched for a new place to live. 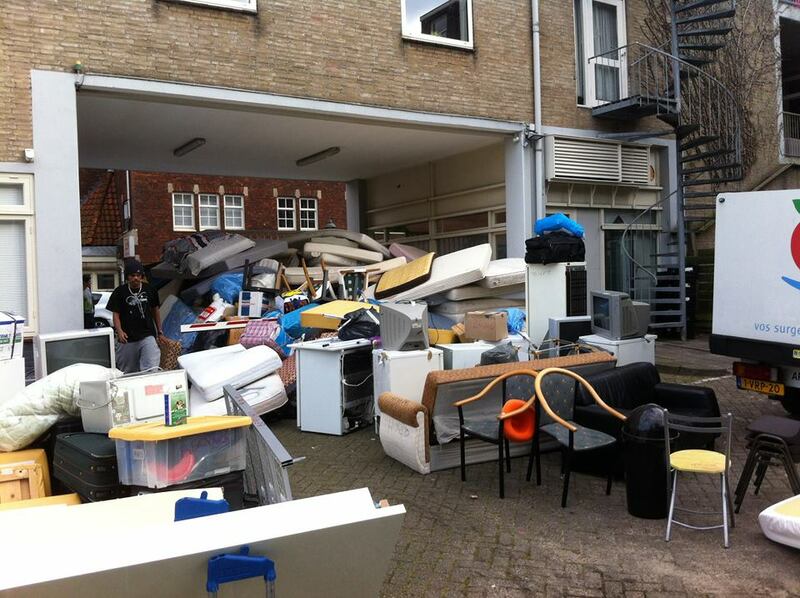 They found the Vluchtacademie at the Dapperstraat in Amsterdam East. 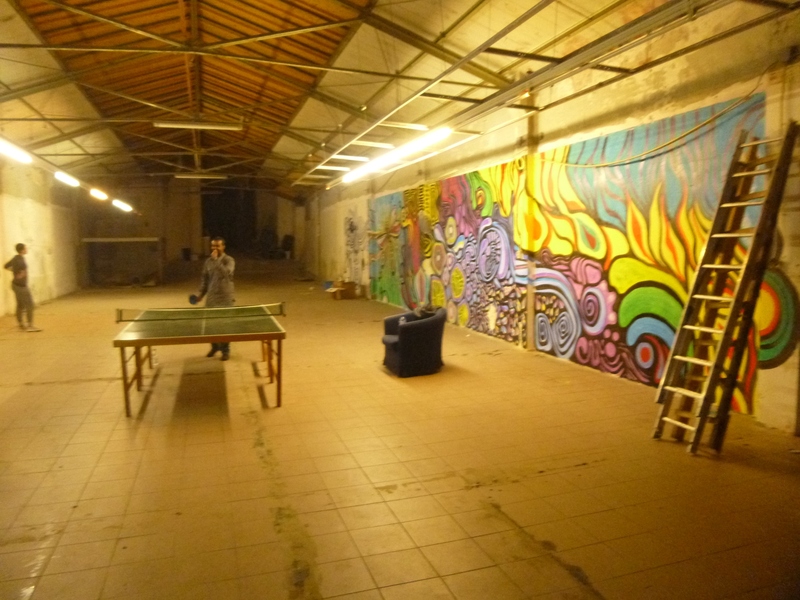 This place was used for the arts academy before and was now empty. The refugees were extremely happy with this place with a wonderfull view over the city and more importantly: water and electricity. 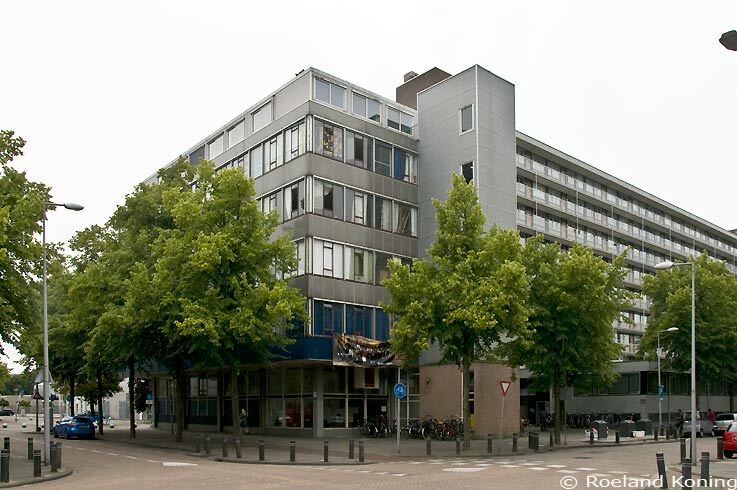 However, the council of Amsterdam who was buying the building treatened the owner with a huge fine if he would not deliver the building empty, so the refugees had to leave again. 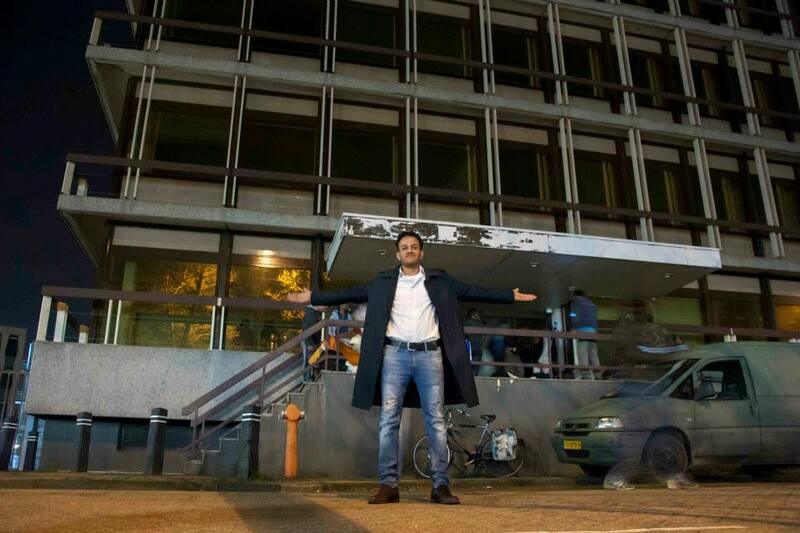 The owner of the Vluchttoren had some delay with his demoltion plans and because there was no new place to live, he offered We Are Here one more month. So the people moved back to the Vluchttoren. Still no new place was found and for the second time Schram Studio’s helped WAH out by offering a place to stay in Amsterdam North. The place is too small for the whole group, but people managed by staying with friends once in a while and people were very happy with a roof and a good location. In the meanwhile the Smaragdgroup had to leave the Wittenberglocation. After several sit-in’s at the BBB, where they could not get a place to sleep because the locations were full – churches offered them temporary place to stay. The group split up in different locations. 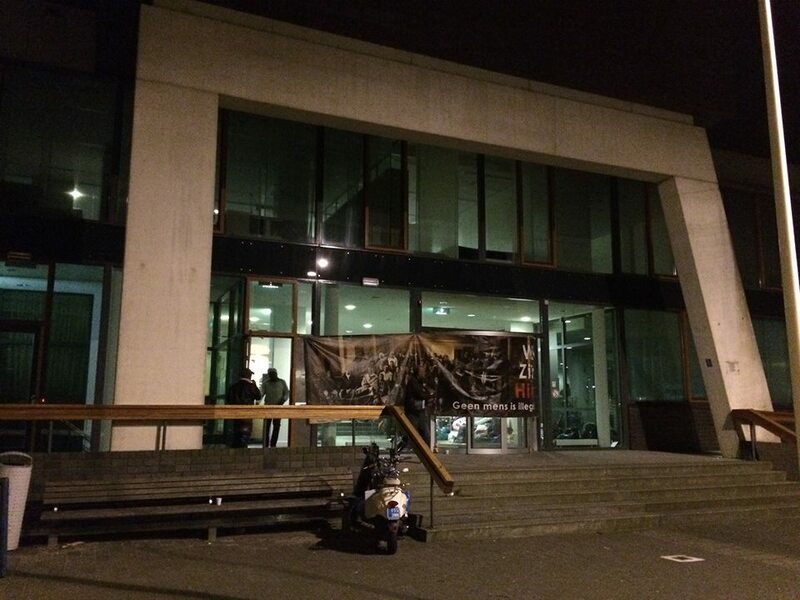 A new place was squatted: the Vluchtbank (named this way because it is owned by a pension fund of a Dutch bank). The building was empty for a long time. Although the location was in the middle of an office district and there was no privacy at all in the building, the group was happy to have at least a roof and a place to be warm. Unfortunately the owner did not show any sign of interest to talk and to discuss about a period of use / agreement and went to court straight away. The group had to leave quickly, leaving another building unused. 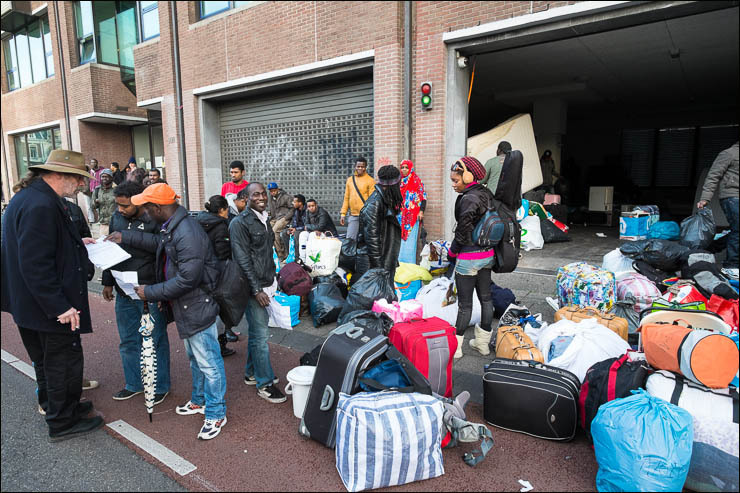 Now that the Vluchtloods was left, it could be used by the Smaragdgroup, as the churches offered the temporary shelter only for a week. Also Schram Studio’s offered storage place for their belongings. 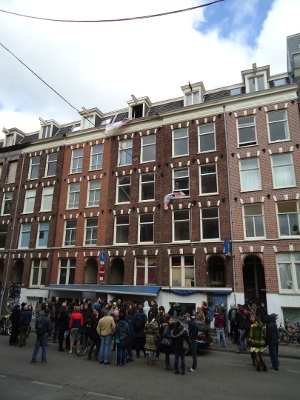 A group of squatters offered support to the Smaragdgroup and squatted the Vluchtmaat for them at Joan muyskenweg 32 next to the Bouwmaat in Amsterdam Overamstel. 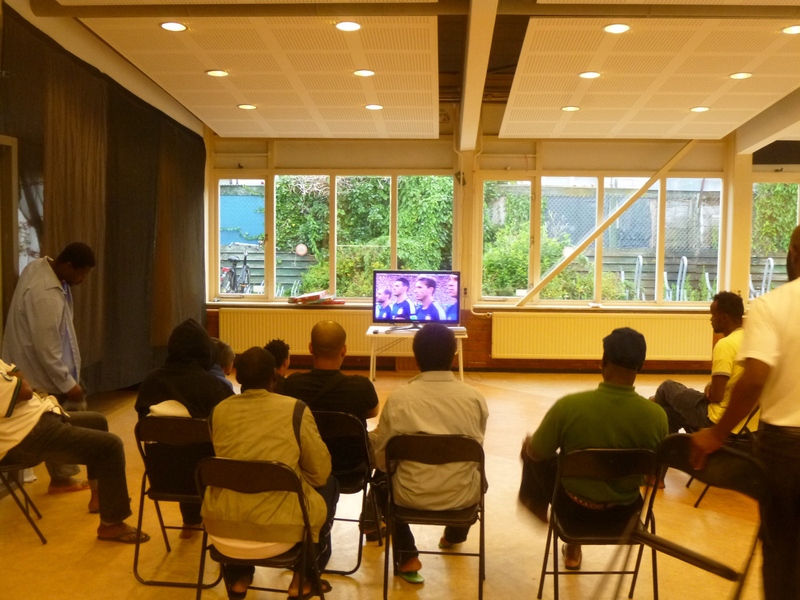 The 15 refugees at Hoogoord join the squat at the Vluchtmaat because the funding for their shelter stopped. 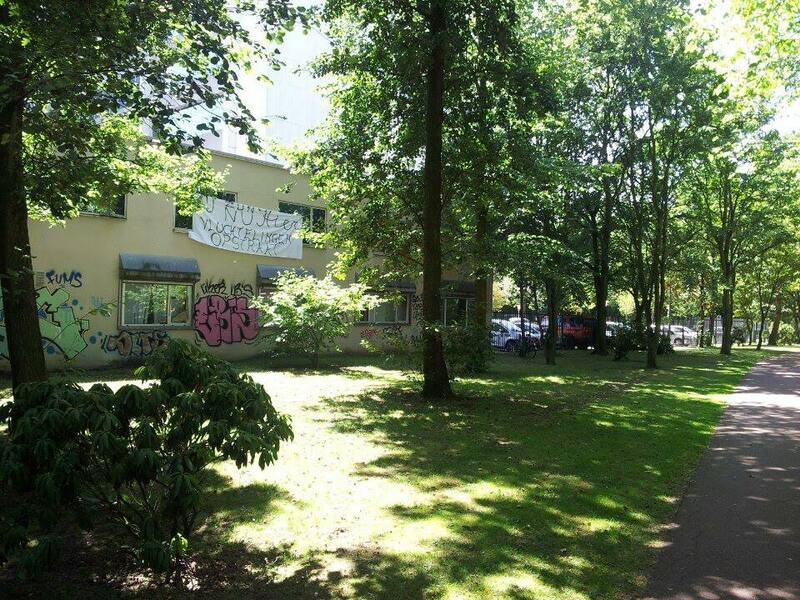 On the day that the Rabobank told the refugees to leave the Vluchtbank, they squatted the Vluchtkei, an office (with adjacant factory) at the Keienbergweg 8 in Amsterdam Zuidoost. Refugees became world news. The stories of people drawning in the Mediterranean, the numerous deaths caused by our border policy and the fact that wars, bombing and destruction lead to people fleeing, finally reaches the European media. The people of We Are Here can tell these stories. Many have survived these dangerously small and overfull boats and experienced the harsh and scary travel by walking, hiding, sitting in a dark truck. It is a black irony that those who can tell the story are now often not heared because people created two catagories: real refugees and not real ones. No idea on what misconseption this is based. 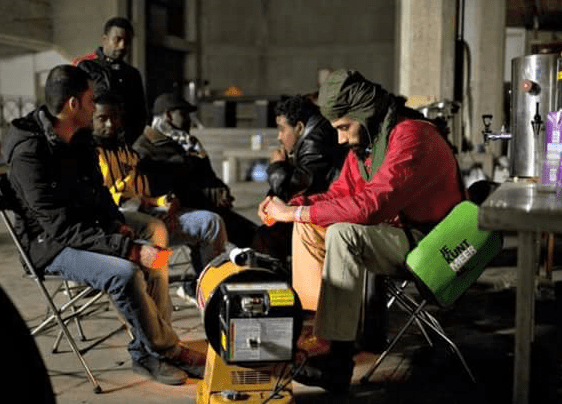 The story of Ahmed helping new refugees on the Central Station and the interview with Yusuf offering them a place to sleep are shared a lot. 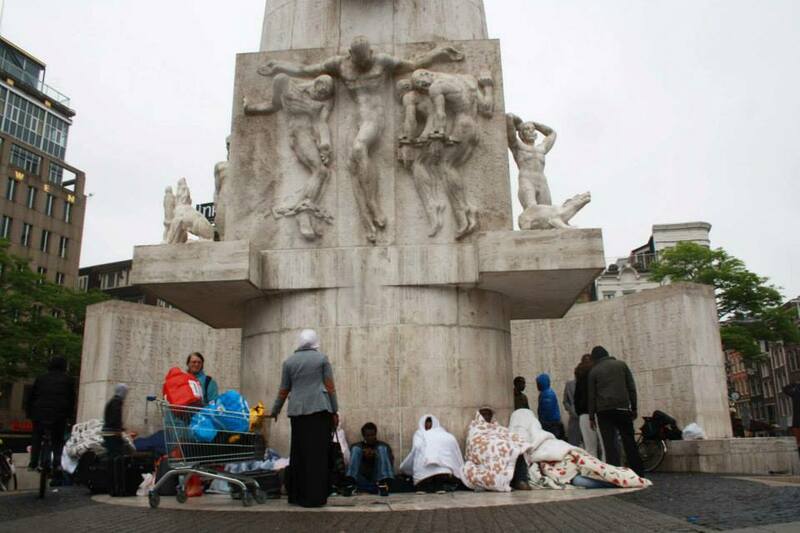 In the mean time the climate in The Netherlands around refugees also becomes quite scary. Extreme right is given space to show their facist ideas openly. When the attacks in Paris take place many of the refugees are very concerned. On one hand they face unspoken or open accusations by Dutch people, on the other hand they see in Paris the kind of attacks they have run from. 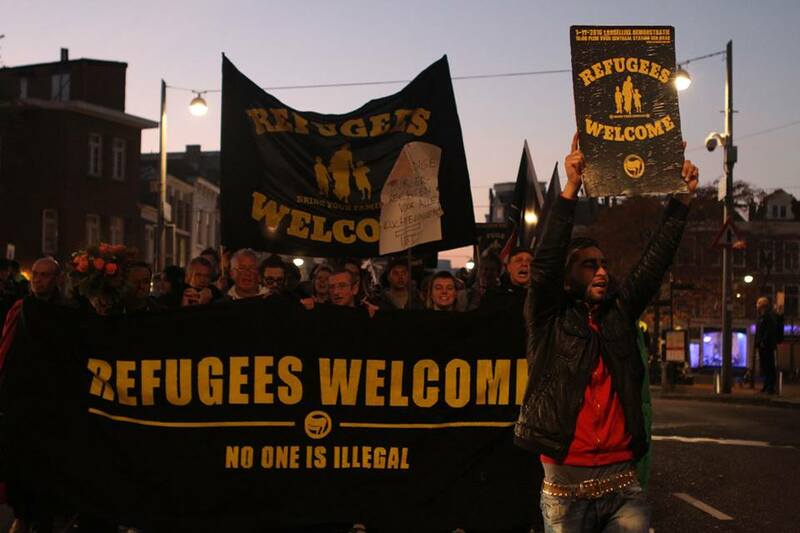 At the same time wonderfull initiatives of Dutch citicens arise, like gathering welcome packages and organising Welcome Refugees demonstrations. 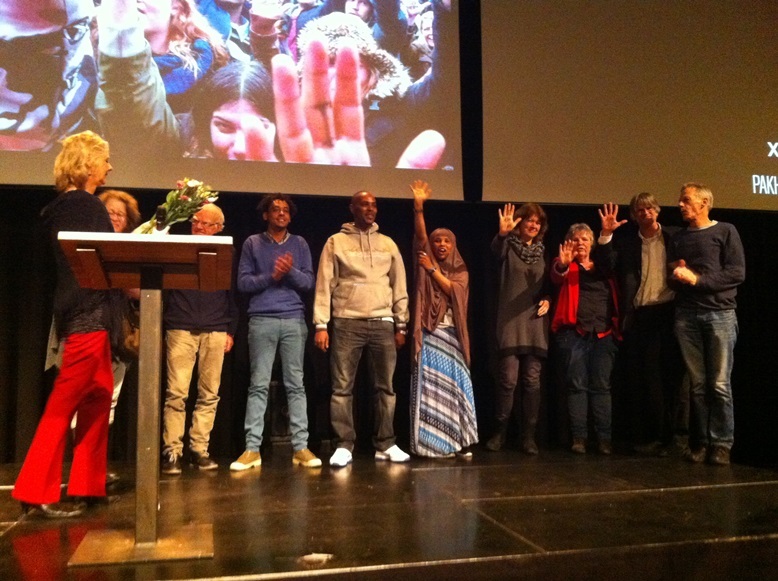 We Are Here attends several of them and speaks, for example in Den Haag, Amsterdam and in Nijmegen. Incredibly some court cases put us more or less back where we were quite some time ago. 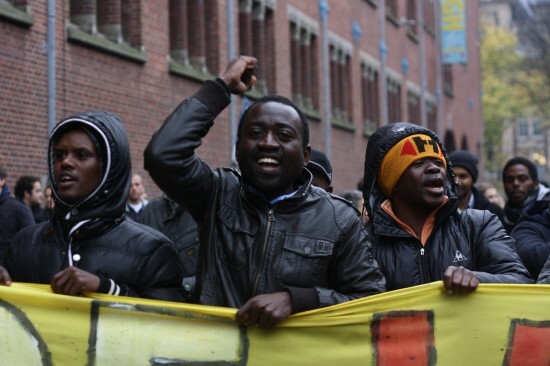 Whereas Europe and several human rights organisations have been very concrete in condemning the Dutch policy and even Germany has refused to use the Dublin agreement to send refugees back to The Netherlands, because they consider it inhumane to send refugees to The Netherlands, judges see this differently. So what to do with We Are Here now? In the mean time also the funds to maintain the group (money is needed for actions, but also for food, electricity, travelcosts, medicines, etc), are running out. So what to do with We Are Here? The answer comes from an unexpected side. 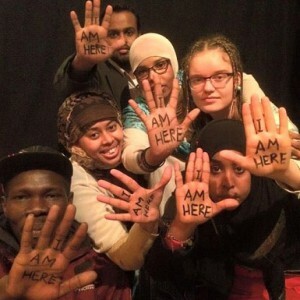 The action group decides to devote itself to running a crowdfunding campaign to raise the money needed for the continuation of We Are Here. And also to see if the aim of We Are Here is supported by the Dutch public. 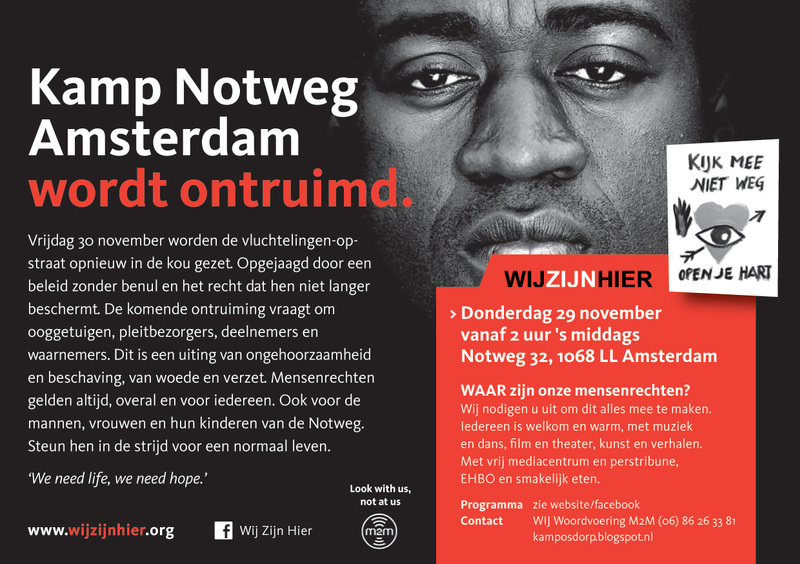 And finally to organise many activities to raise awareness around We Are Here (like a flyer action at the ferries with singer-songwriter Rogier, benefit parties, etc). The result is overwhelming: within weeks 14.000 euro is collected. This is a clear sign of support and We Are Here will continue its fight in 2016! 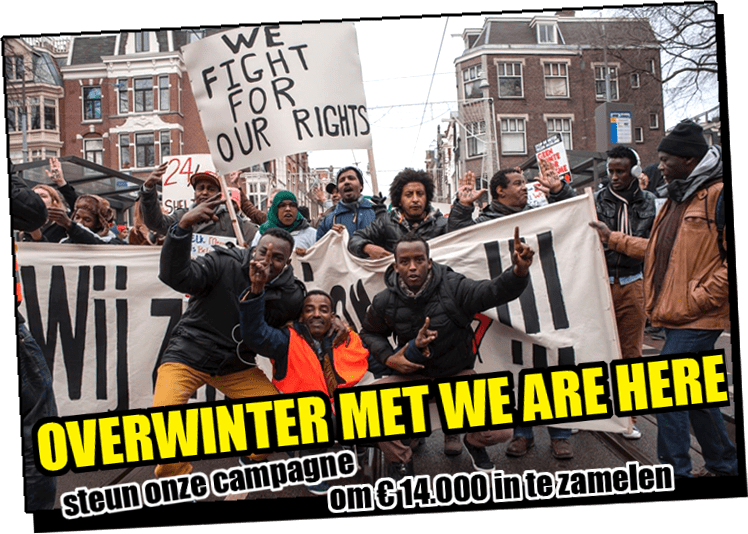 While economy in The Netherlands improves and most of the inhabitants profit from this, it brings an extra complication for the refugees from We Are Here. A project developer we spoke, explained us that around Amsterdam for most buildings development plans exist now. This means it is difficult to find an empty unused building for the undocumented people to live in. Buildings that were empty for years and seemed squattable, appear to have plans and the refugees need to move out again and again. In the mean time bombs keep raining on Syria and refugees keep running from the violence. A disastrous deal between Turkey and the EU leaves 50.000 people trapped in Greece. 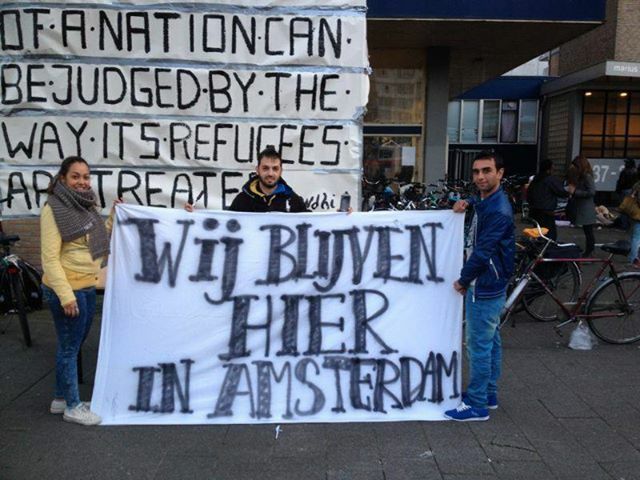 New refugees who enter The Netherlands slowly start to realise the procedure is not working well. Although most of the Syrians do get their status, they have to wait long and family reunion is not working out. 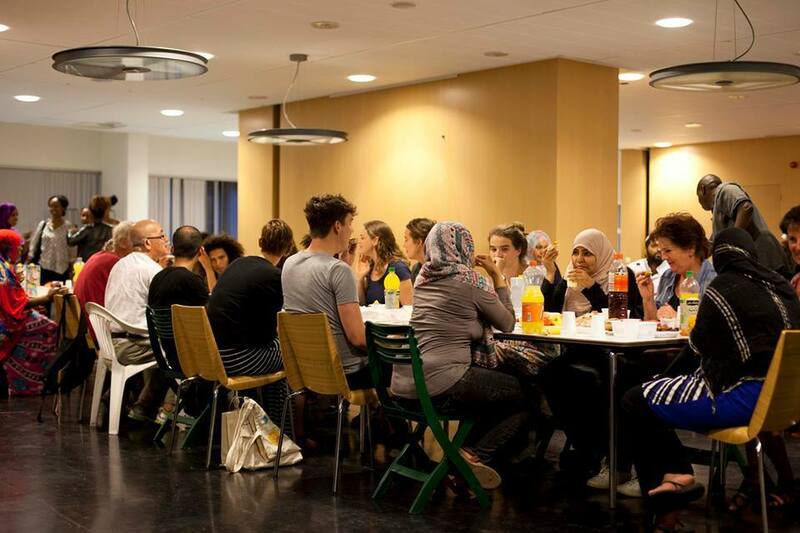 Slowly refugees from We Are Here and from the Havenstraat (previously house to We Are Here) and other temporary locations for new refugees start to meet each other. On the other hand it seems that the attention in the media and political context is shifting towards the new refugees, leaving the topic of the asylum gap unanswered. 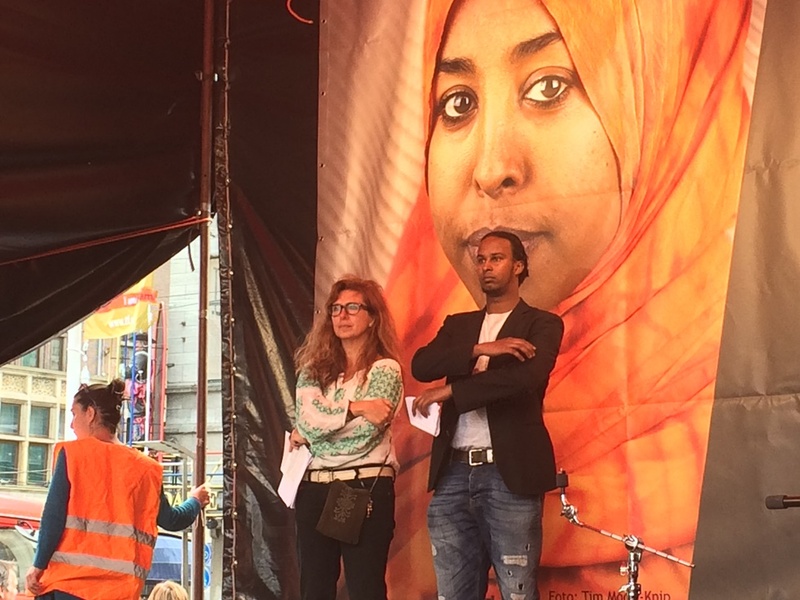 Time for a new approach: in stead of speaking to media or taking the streets, this time members of parliament are addressed directly by ten letters, in which different aspects of the asylum gap are explained, together with concrete examples from the group. 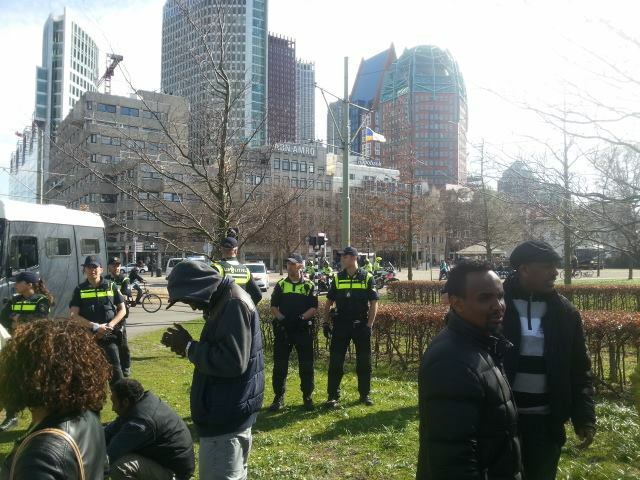 We Are Here is also put back on the agenda, when lawyer Fisher gets the news that the European Court of Human Rights will deal with the BBB (Bed, Bath, Bread) case of The Netherlands with priority. But above all the gap in the asylum system is proven by all the refugees that receive their status. Every document is a small party. The number passes the 60. A lot of people who were once called ‘out of procedure’ finally get their right. The lost time is never payed back, however. And many more are still in the hopeless situation of waiting and proof not being accepted. 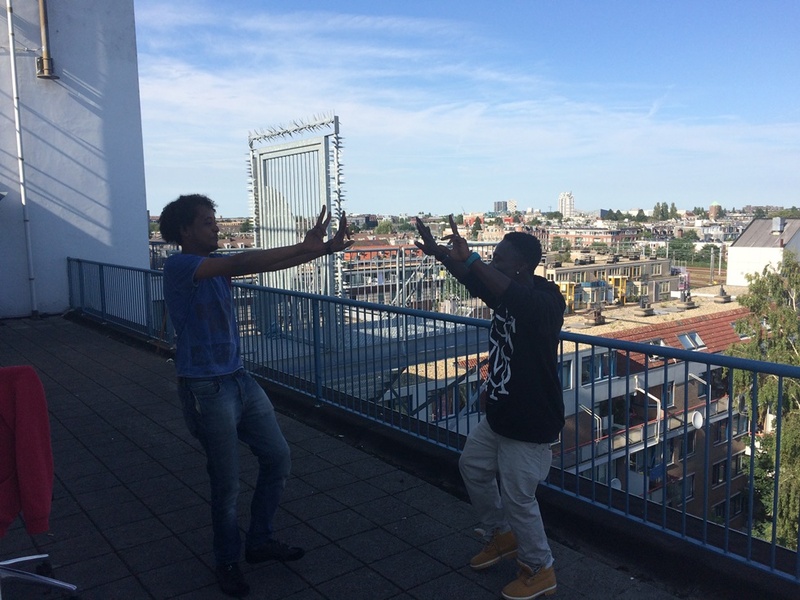 Refugees keep working on their skills and present the We Are Here case in different ways. In stead of the We Are Here Academy where professors teach the refugees, there is a Here We Are Academy, where the refugees teach others. 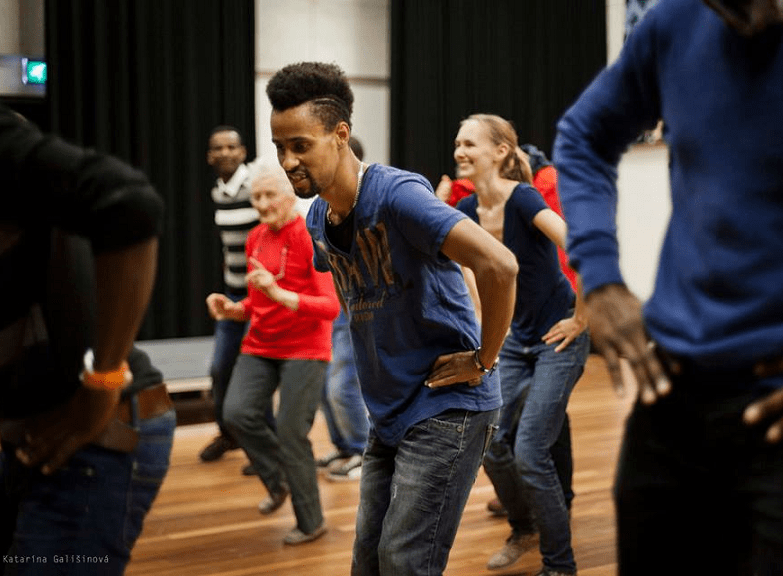 There are screenings of the documentary We Are Here all over the country and also inside the We Are Here buildings, so new people can learn about the history of the movement and old time members can bring back memories and get inspired. 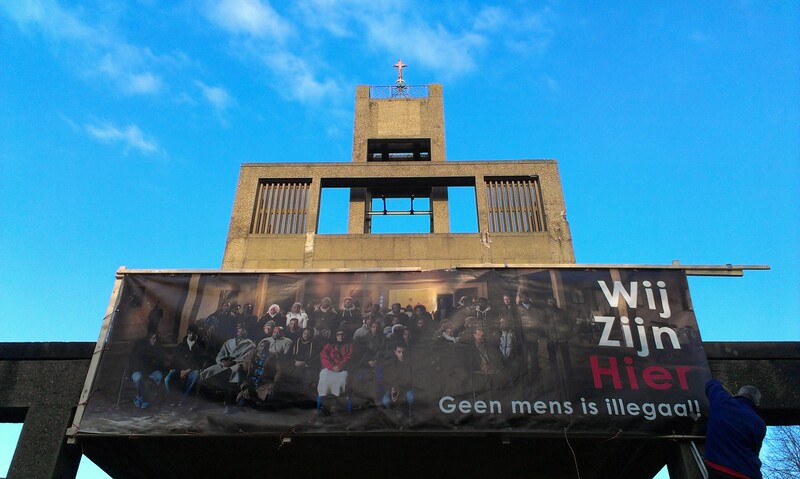 Also a presentation of We Are Here history takes place in the Vluchtgemeente. The Academy starts a media training, refugees turn out to be amazing cooks and serve dinners, represenatives speak at different occacions and the We Are Here footballclub gets more and more professional. We are nominated for prices and win one. 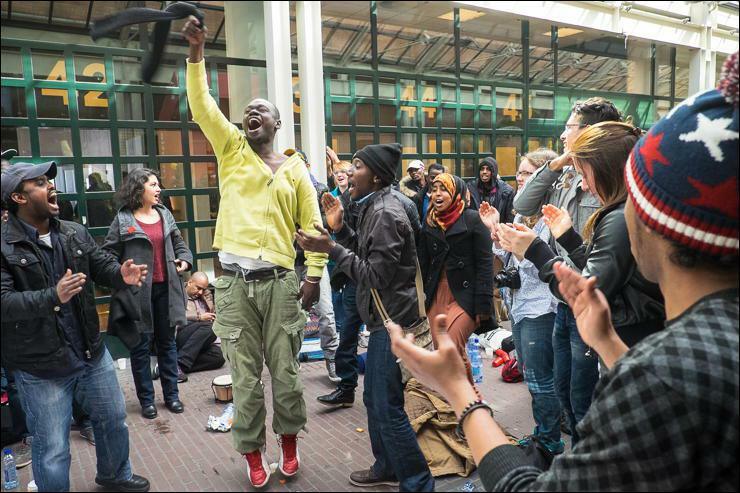 The refugees were so happy in the Vluchtkei. Finally a building that could actually be called a living place. It could be heated, it was neat. People felt very much at home and it was kept clean. People who made a mess were sent out of the group. However, the building belonged to a family business and the presence of the refugees was quite a burden so the group could not stay long. 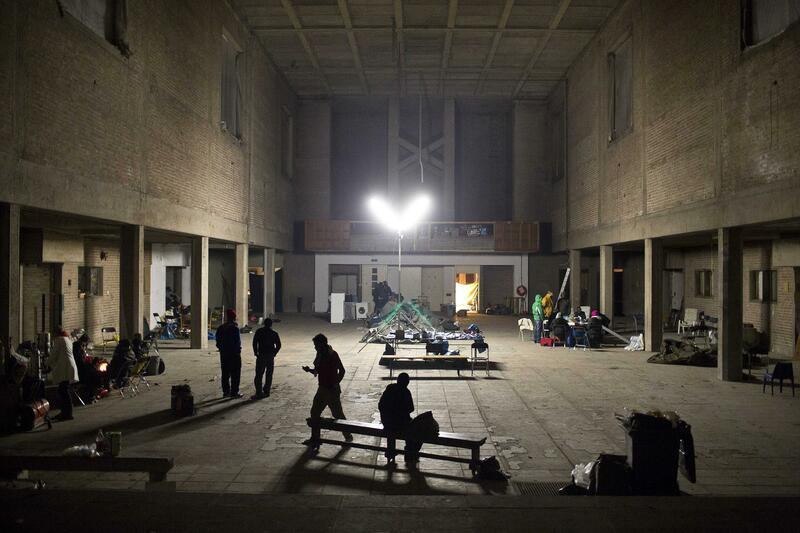 The refugees were sceptic about the next location, but seeing the inside changed everthing. It looked very fancy and it affected the people. Nice events were organised, people looked quite relaxed. Although at first side it did not look too much suitable for living, people made their rooms out of it. Again we could not stay long. While handing in the key, the person responsible for the building said he had never seen such a nice and clean delivery. 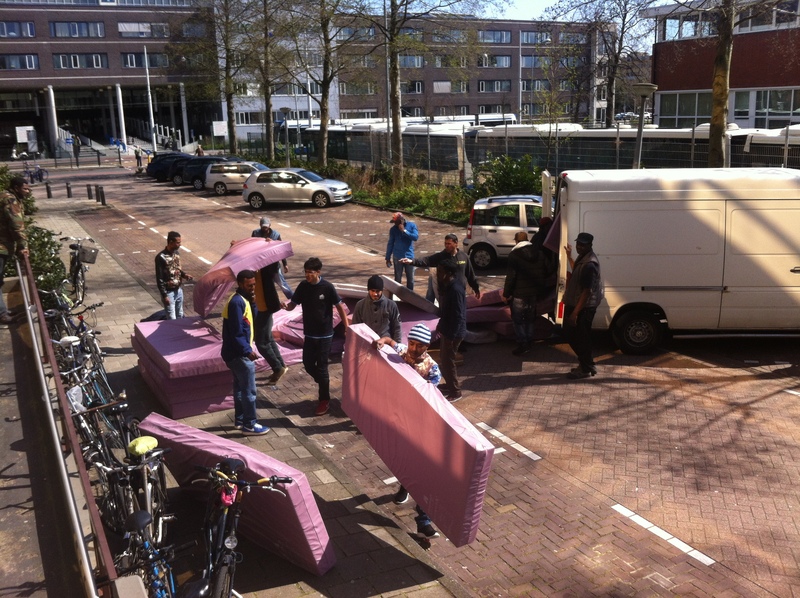 The day of the move to the Vluchtpoort was still a chearfull, sunny day. The new home was next to the Amsterdamse Poort in a complex that was meant to become ‘Zuidoost-Mixed’. The project never got funded and the refugees felt that they could still make the project happen by living in the building, that was empty for many years. The atmosphere got worse by the minute, however. It appeared to be impossible to get the water and electricity working and the coldest days of the year happened to be in this period. Also after being empty for years, the plan was to start removing asbestos the next week. In agreement with the project developer this was postponed a bit but the group left soon. Luckily there was another very empty building that had better conditions. However, bad luck again: there was a renter for the building. The building never actually got a real name. 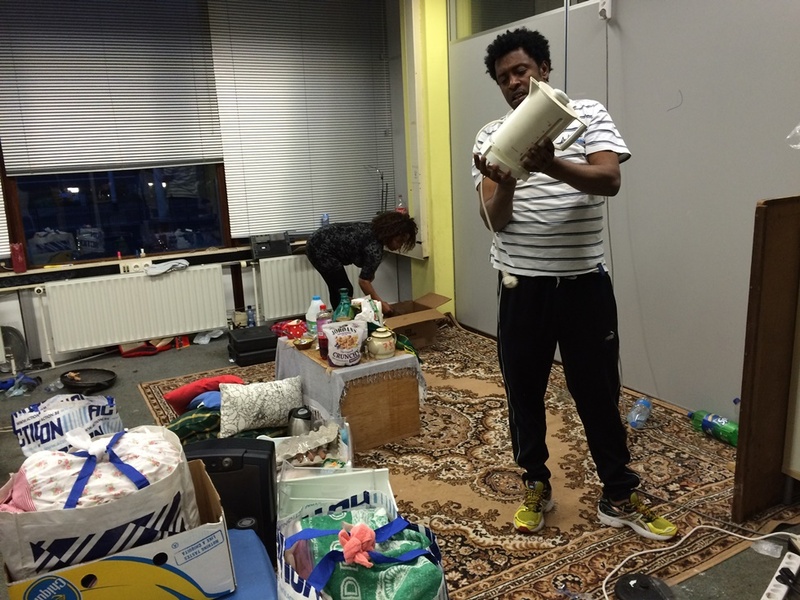 Refugees became tired, stressed and frustrated about all the moving. Our eye fell on a firebrigade building that was abandoned recently. No plans seemed to exist for this building. It was locates in the Nelson Mandelapark so the name became Vluchtmandela, which gave the place something extra. 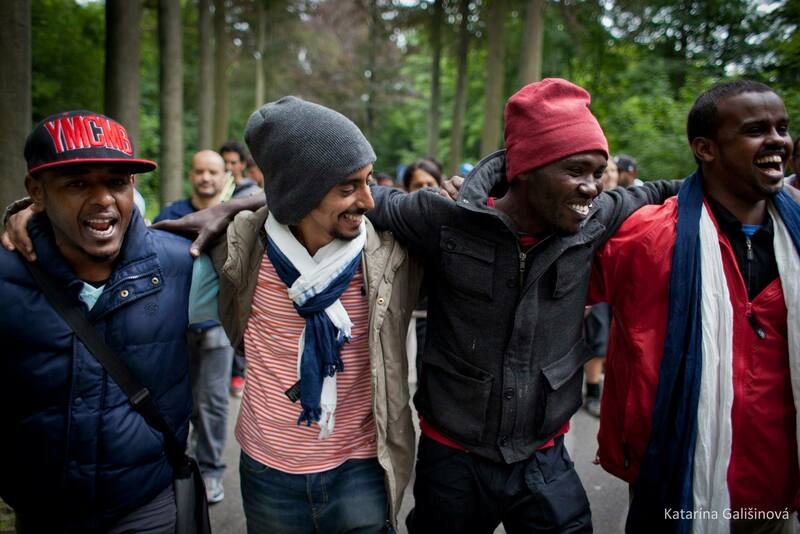 Thanks to the help of many, the refugees managed a speed-squat-and-move. 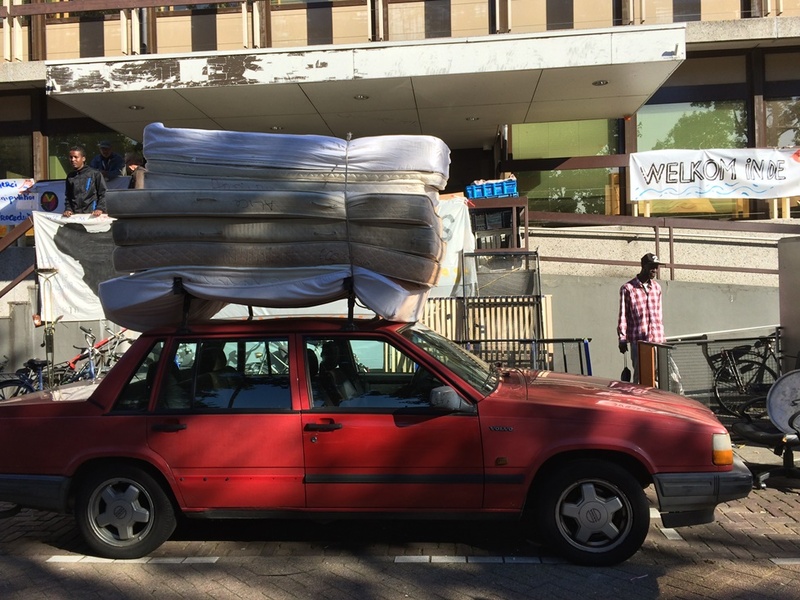 Directly after the squat, the matresses were arriving. 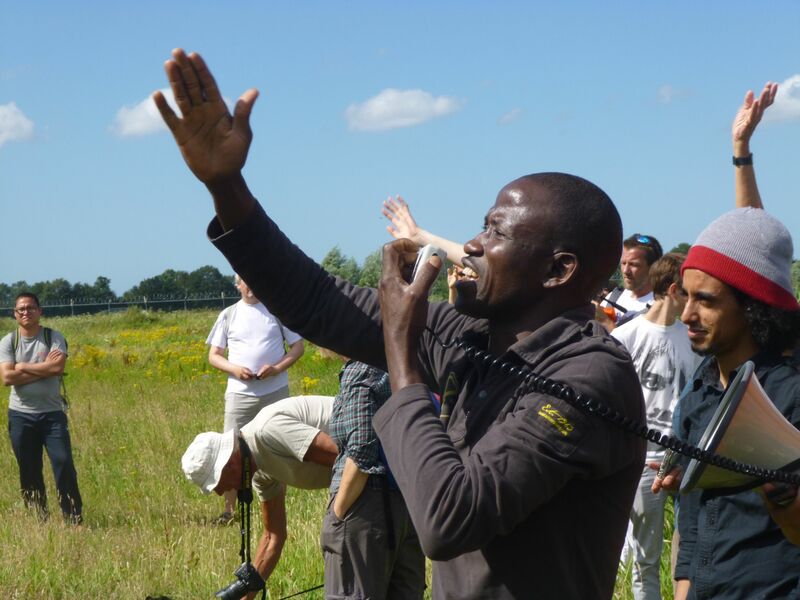 Thanks to the weather and the nice food brought by a supporter the Vluchtmandela had a sunny start. Facilitie were very much improvised, however. Cooking had to take place in the house of a supporter living nearby and there was no electricity so evenings were dark and frustrating. This time the building was going to be taken apart into containers that it was built from, so again the refugees needed to move out. After so many moves in short time, people were tires and out of options. Also the group became smaller after every squat. 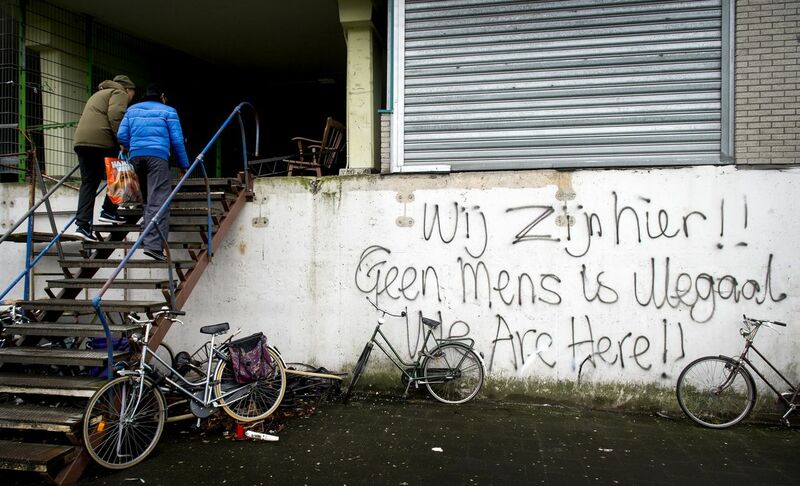 The remaining refugees decided to move in with their brothers and sisters in the Vluchtgemeente, where some space was created.